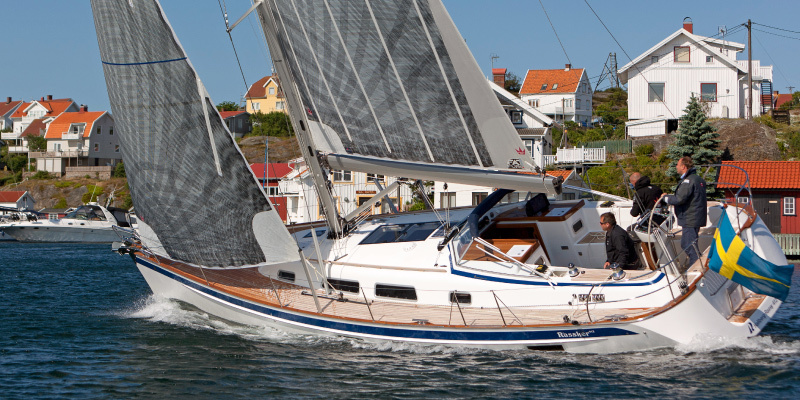 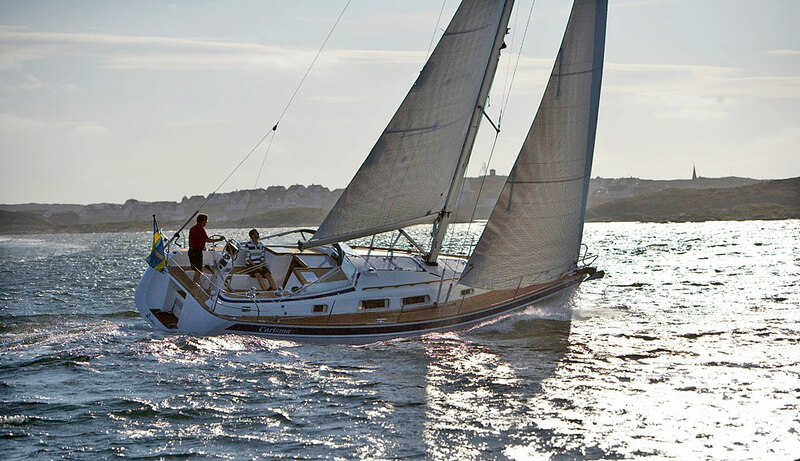 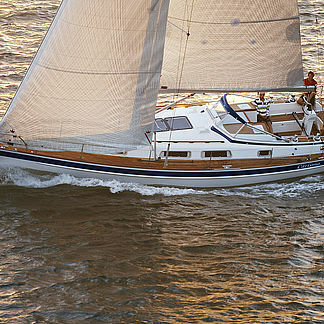 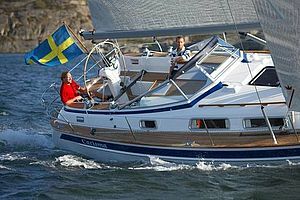 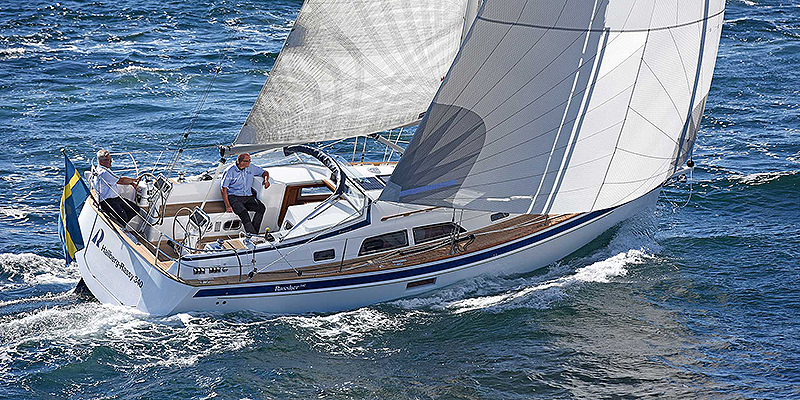 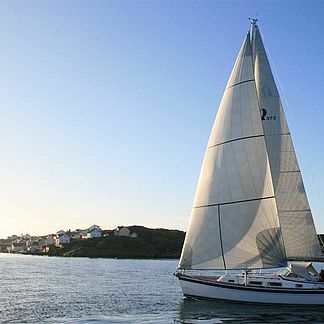 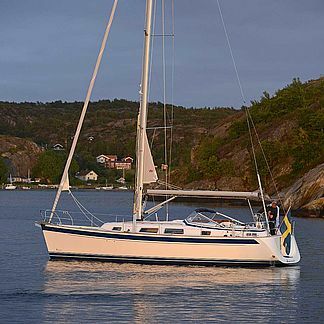 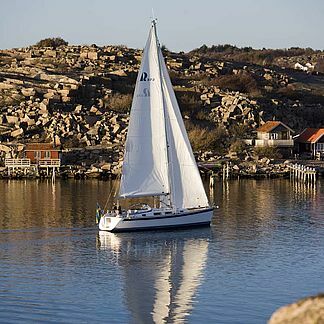 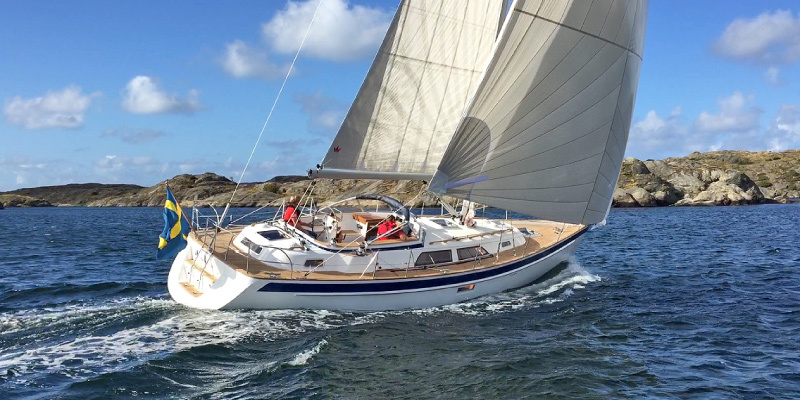 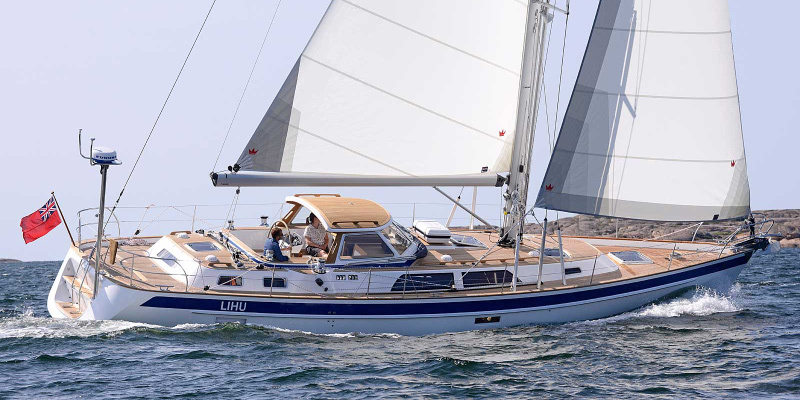 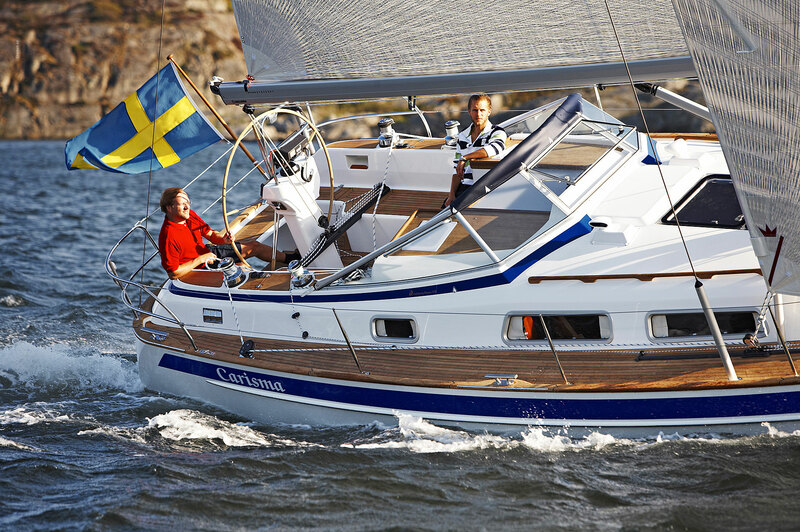 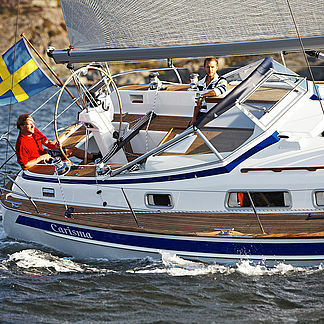 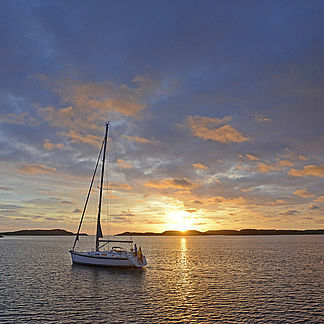 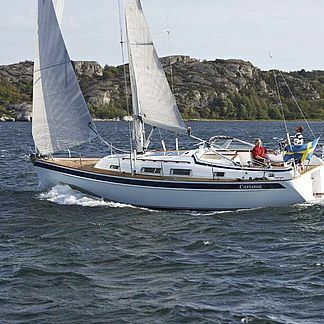 "EUROPEAN YACHT OF THE YEAR - LUXURY CRUISER"
The Hallberg-Rassy 372 is optimized for comfortable and fast family cruising. 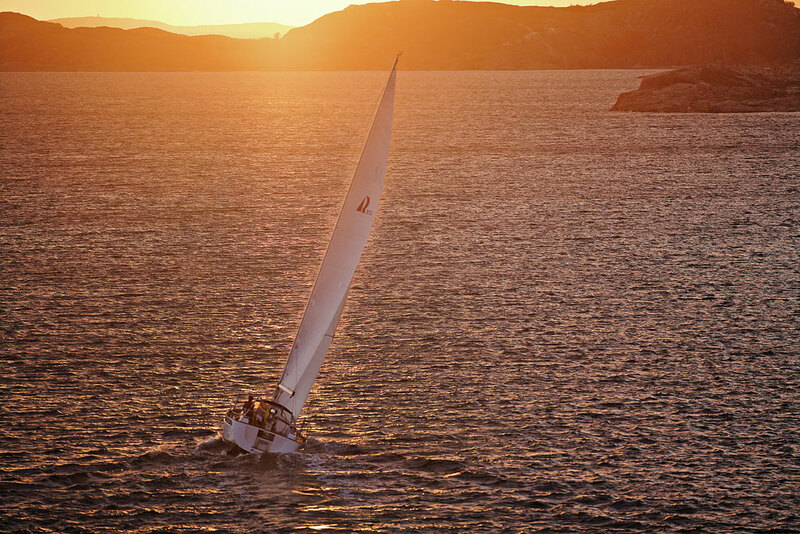 She will take you anywhere, anytime. 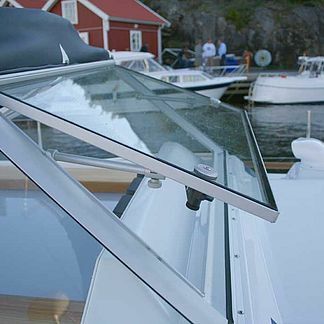 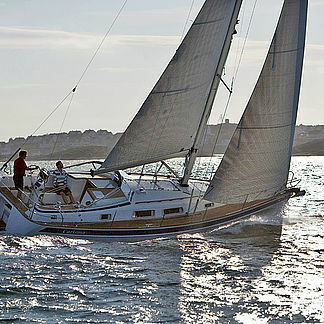 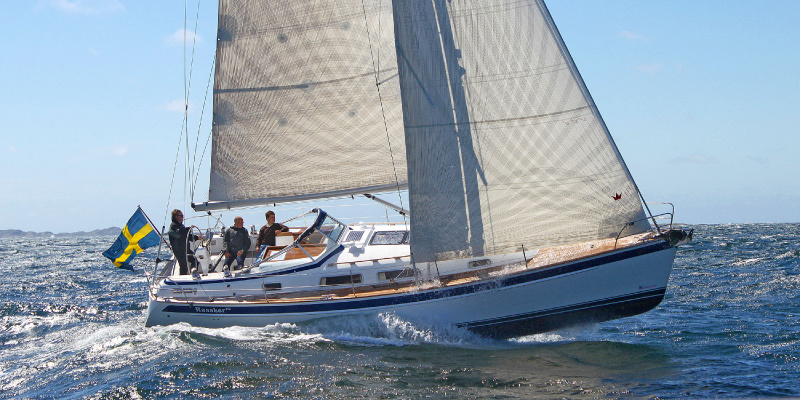 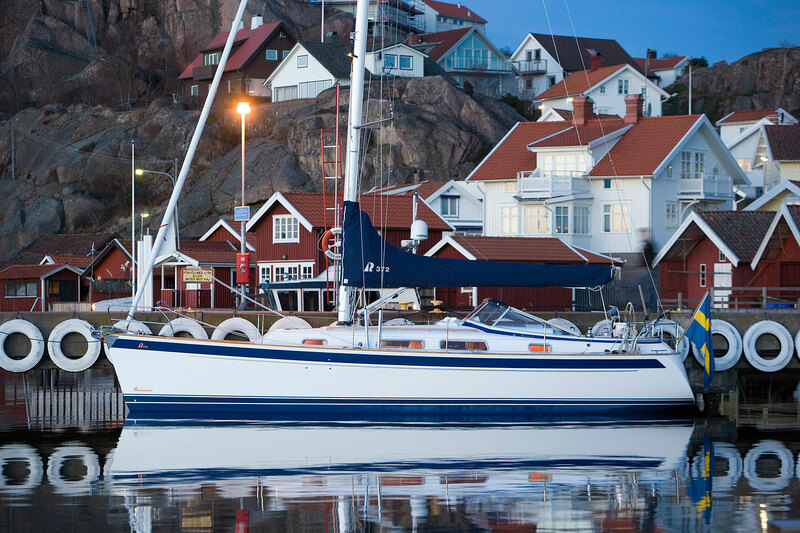 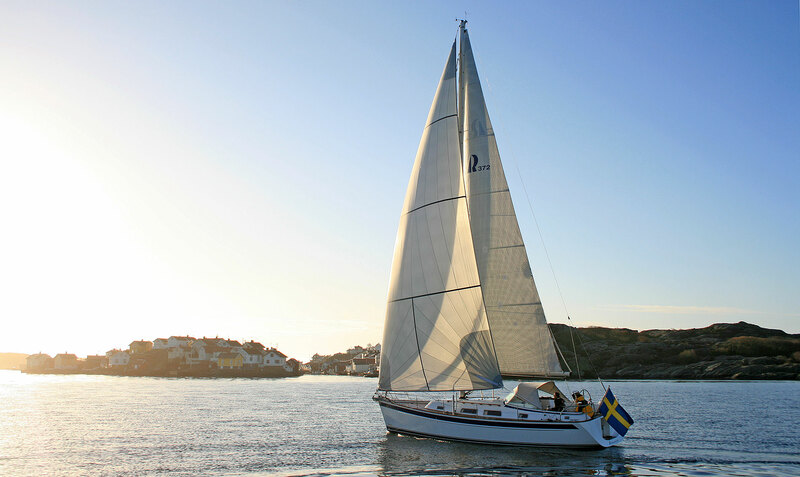 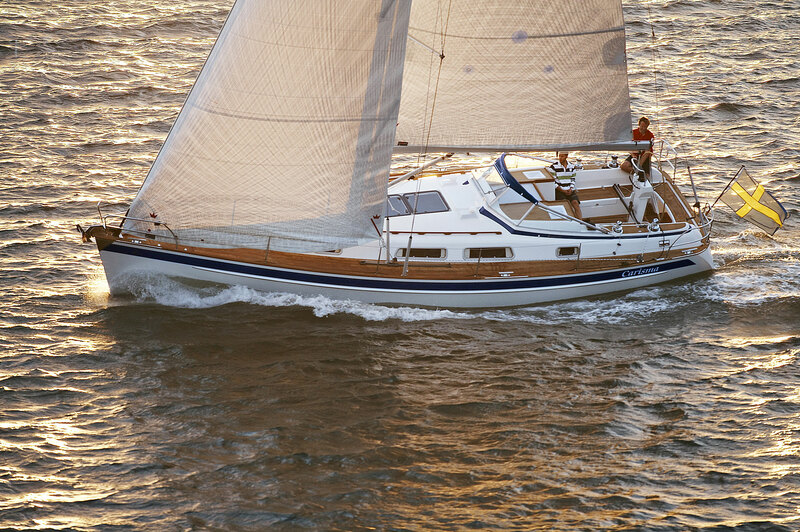 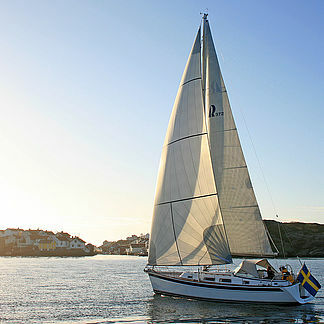 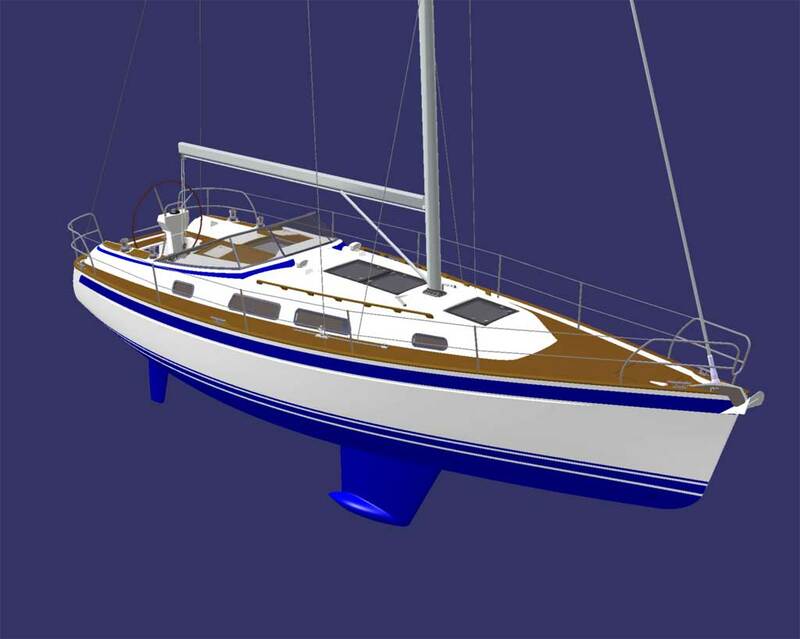 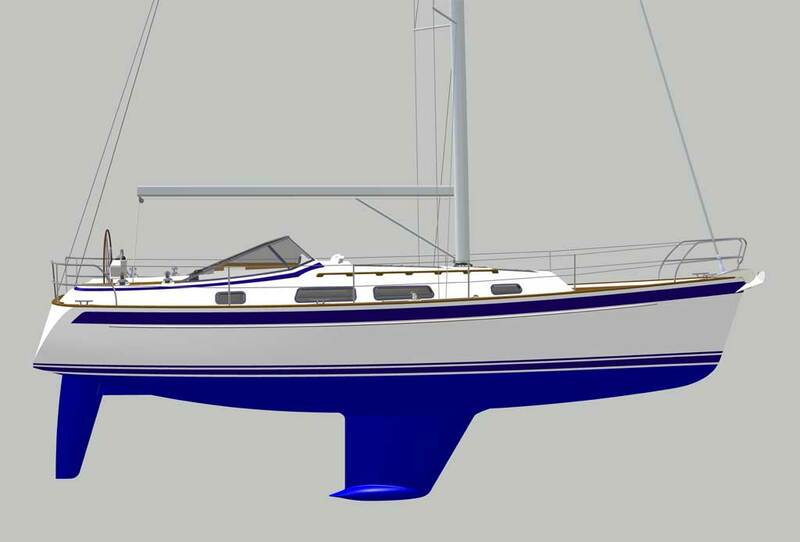 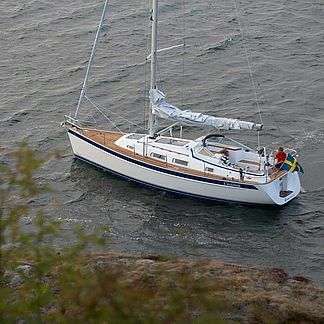 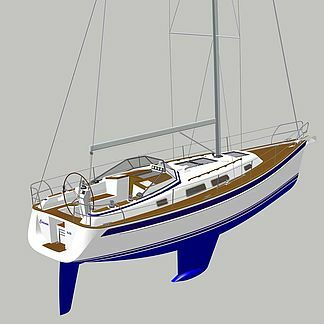 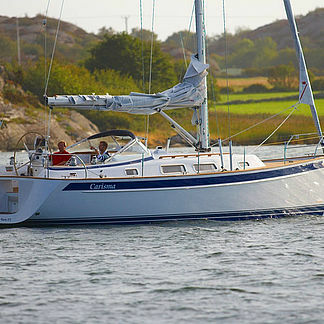 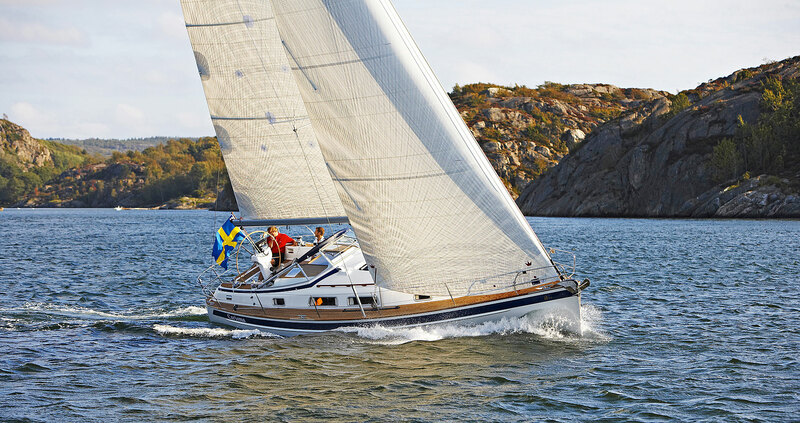 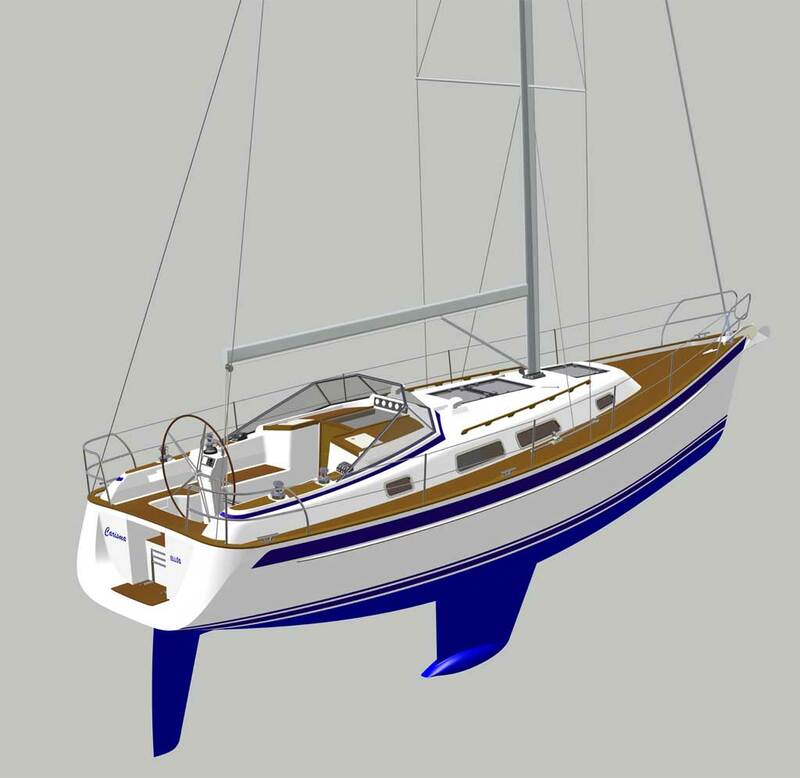 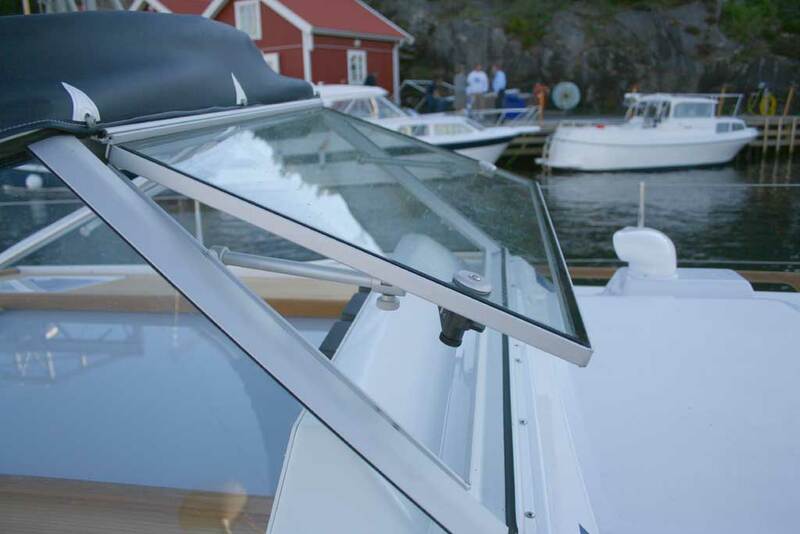 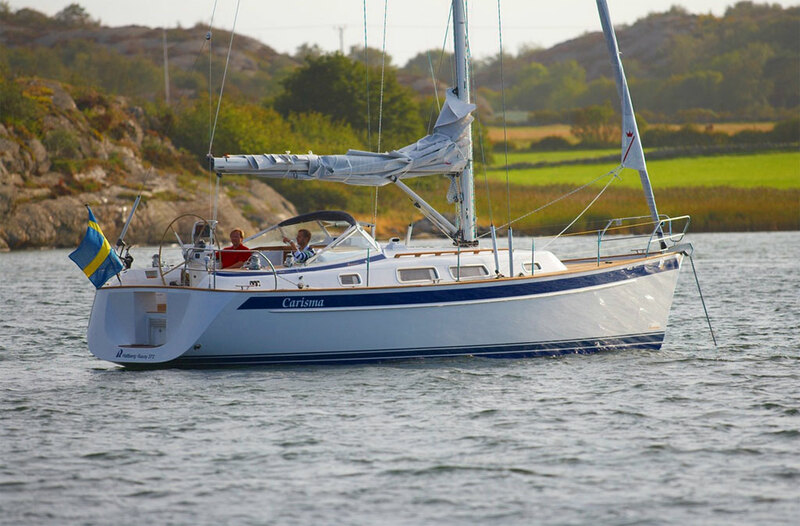 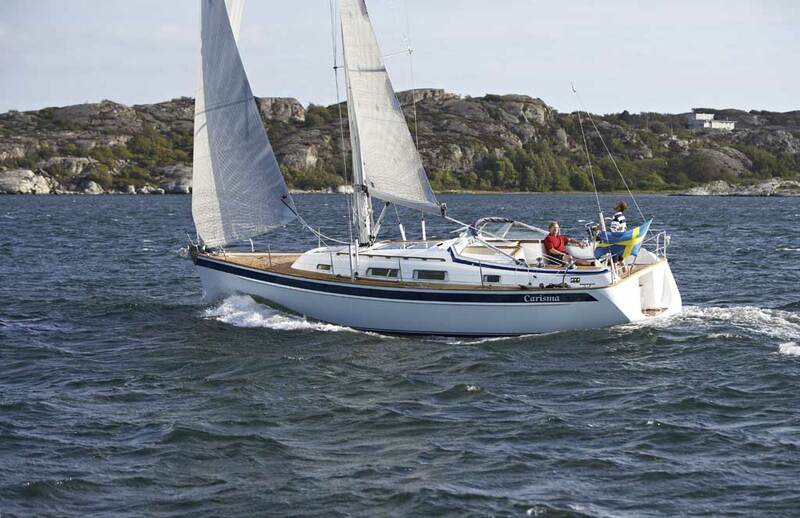 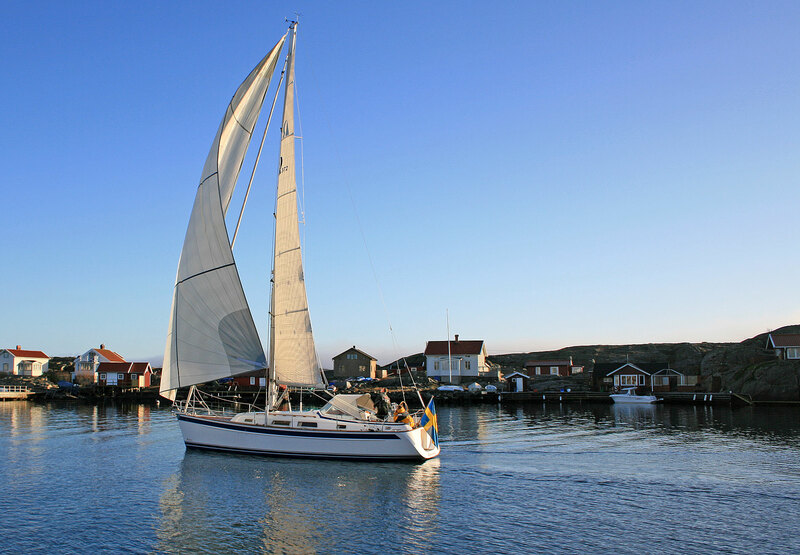 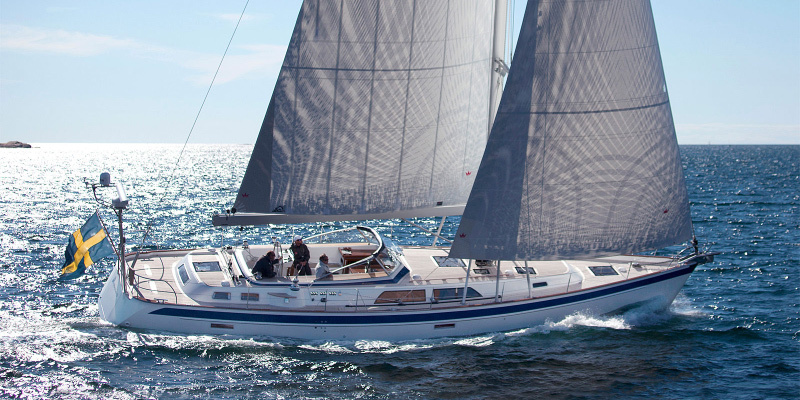 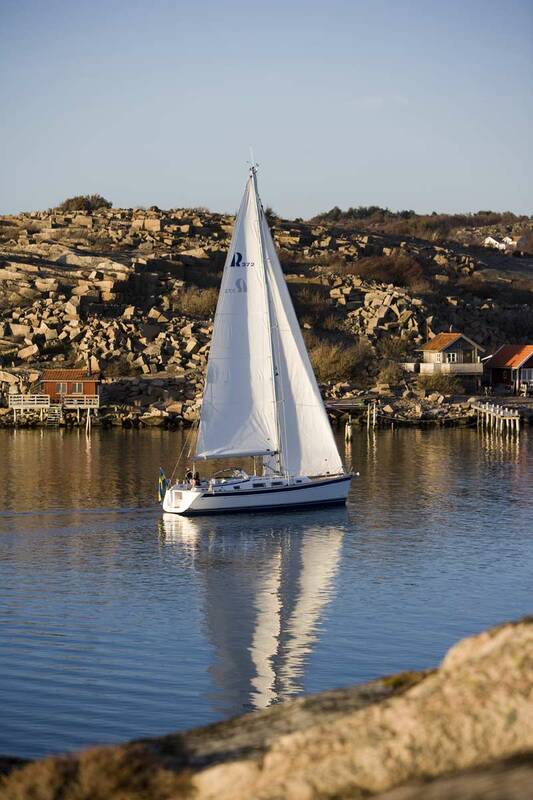 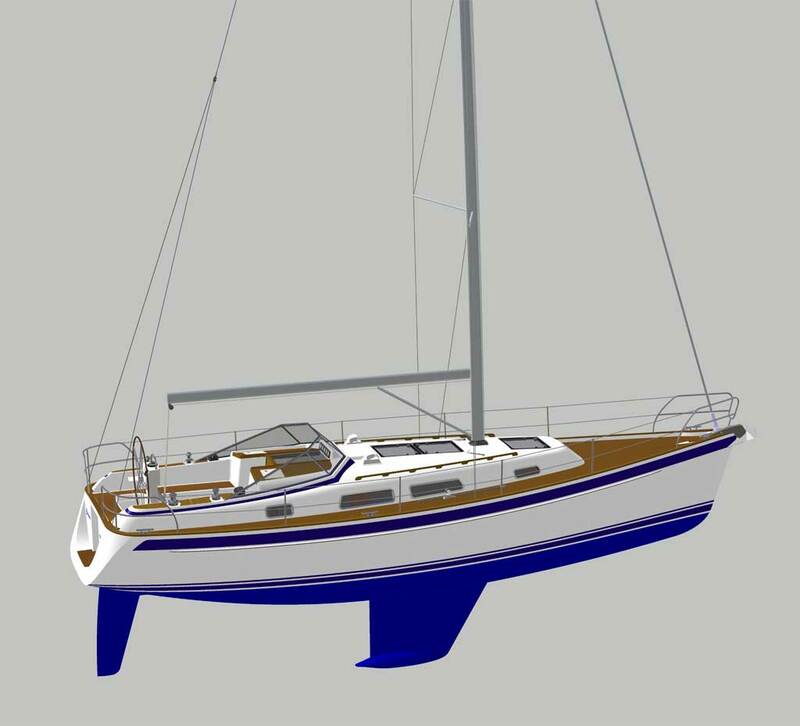 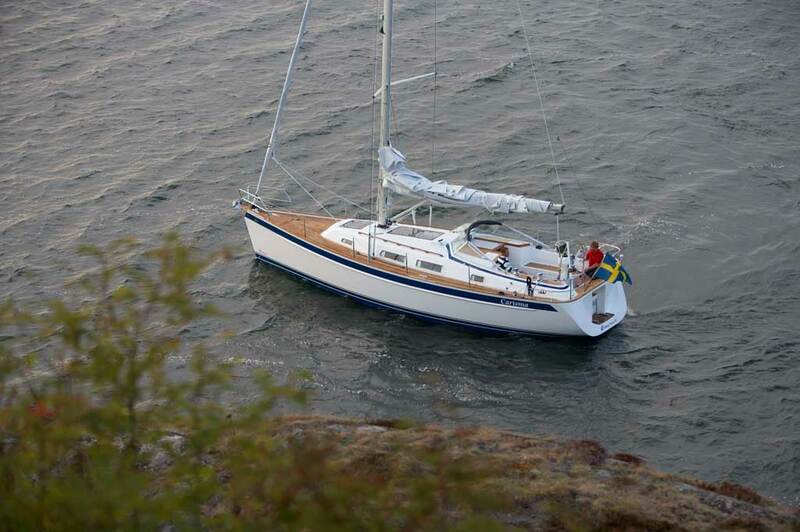 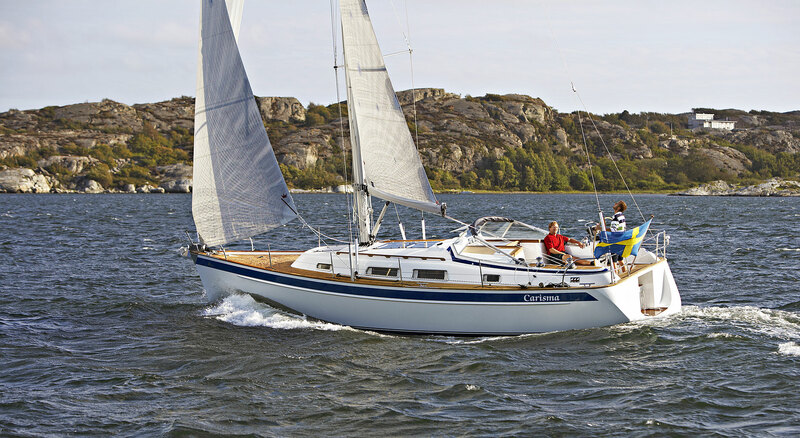 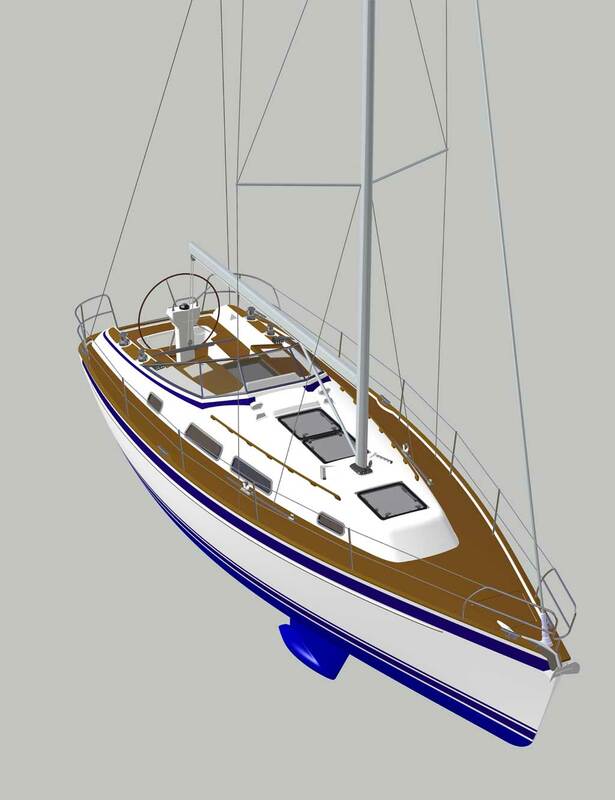 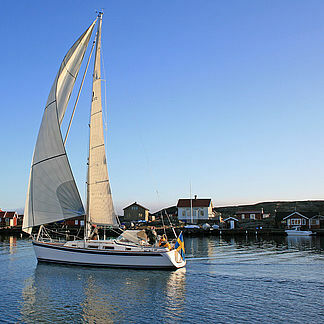 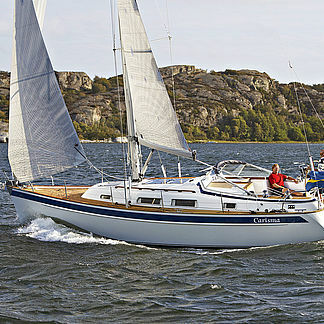 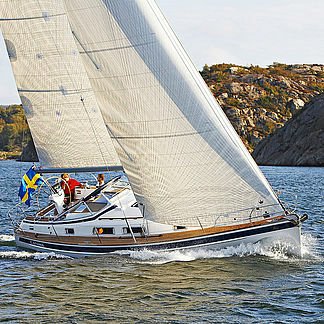 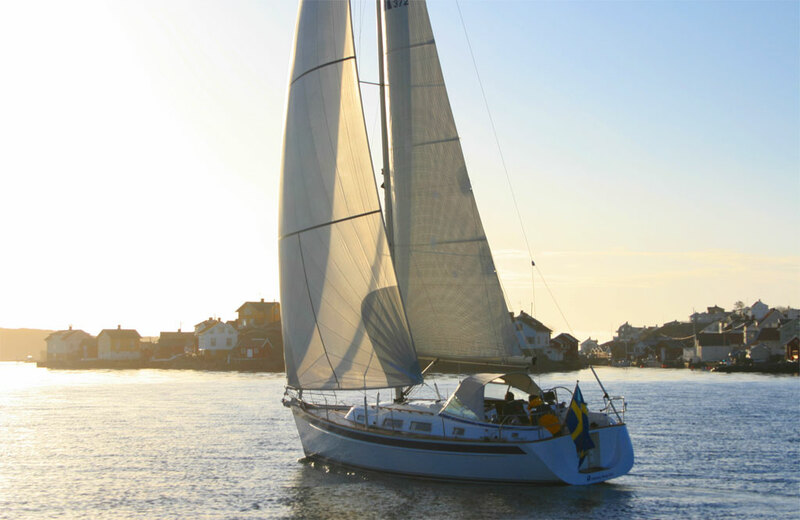 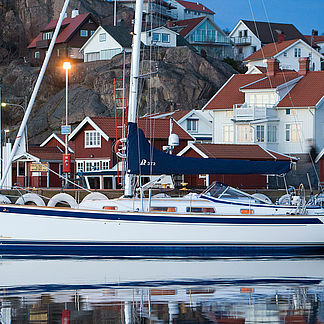 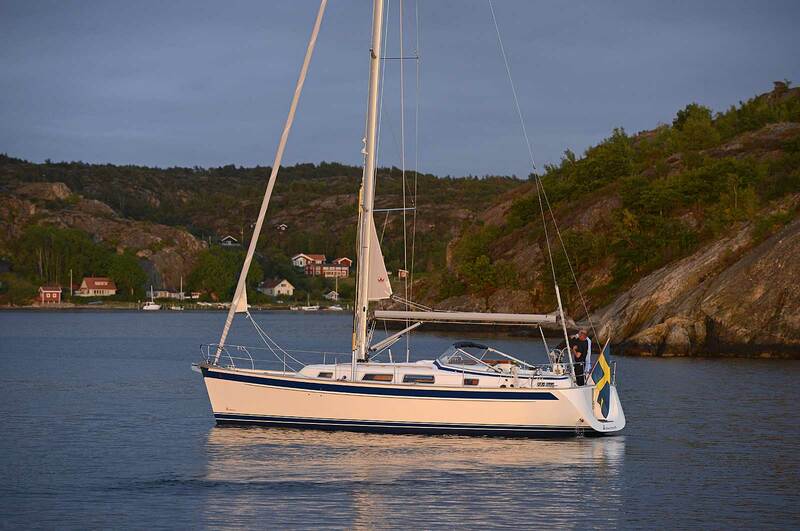 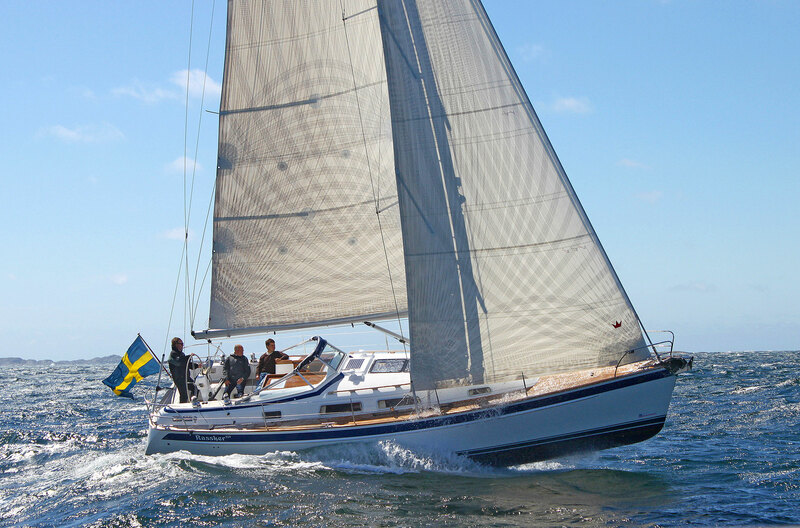 Compared to the Hallberg-Rassy 37, the 372 is only a few centimetres longer, is 5 cm wider and has a fuller transom. 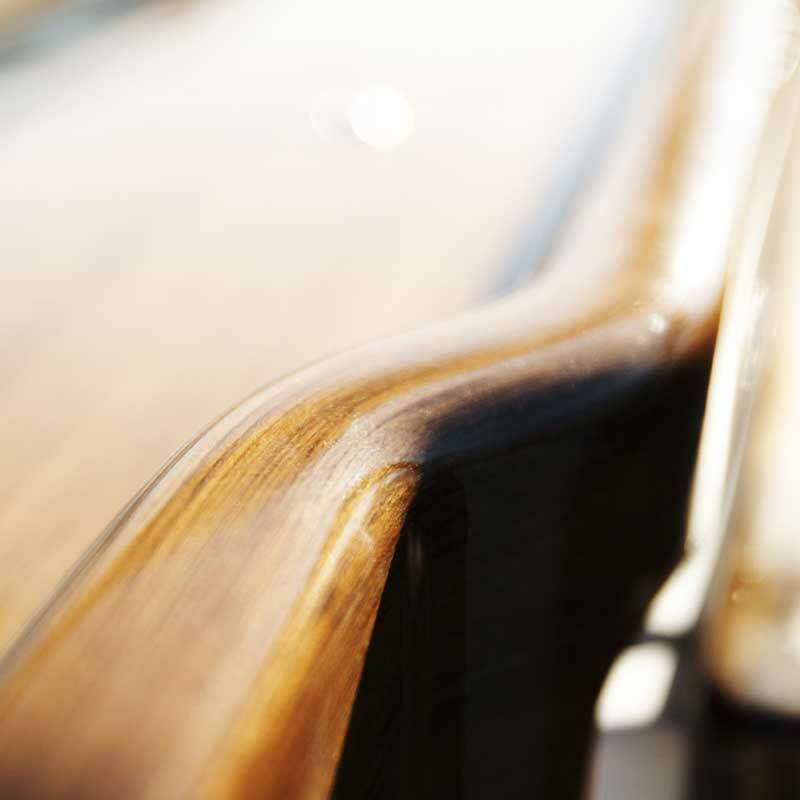 The canoe body is slightly shallower and the keel slightly deeper and lighter. The aft and mid sections of the hull are flatter and the bow section sharper. 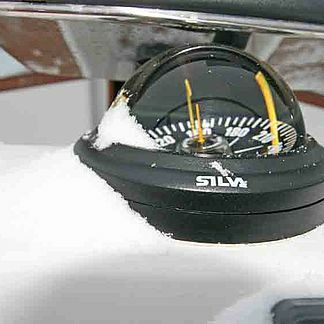 The sheer line is more pronounced. 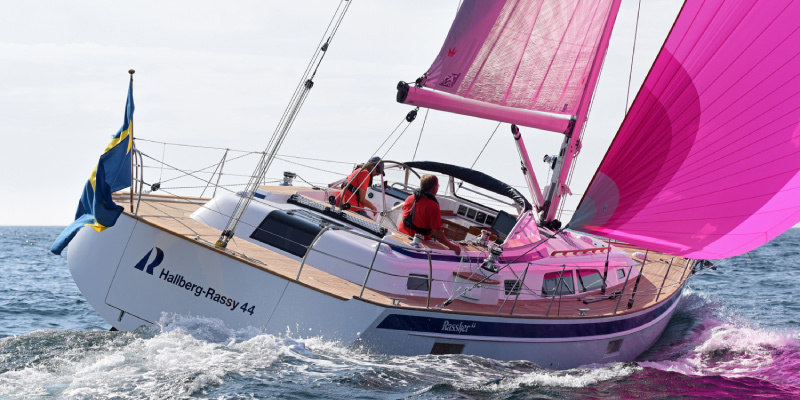 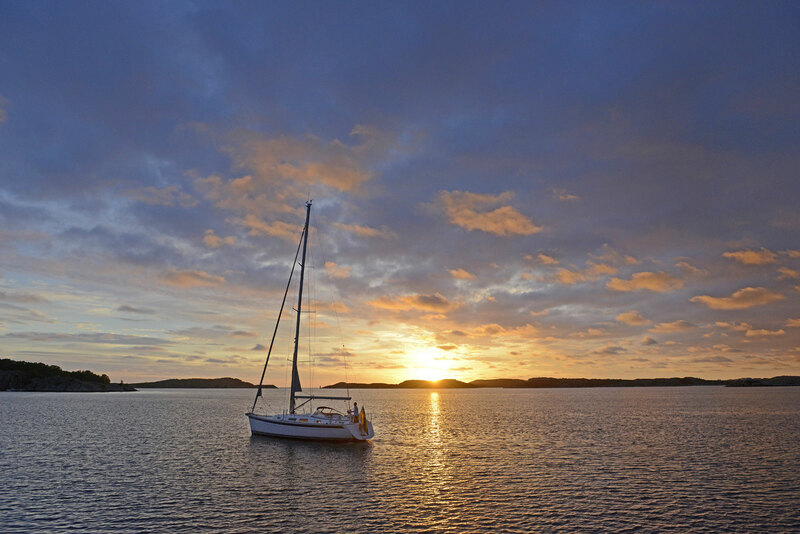 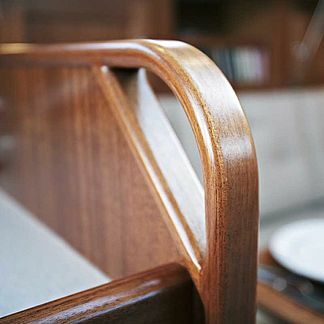 The modern sailplan is easy to handle. 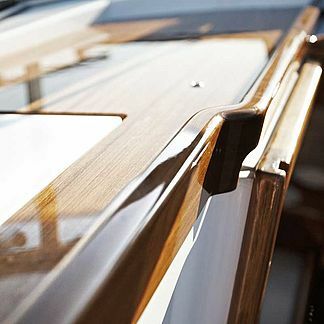 The yacht breathes graceful elegance. 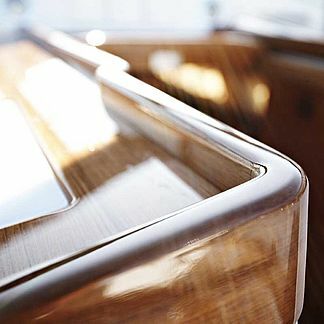 Hallberg-Rassy may be best known for its centre cockpit boats, but over 5 600 of so far 9 000 built Hallberg-Rassys have an aft cockpit. 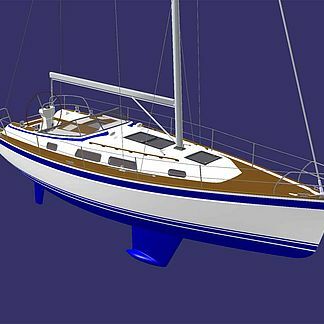 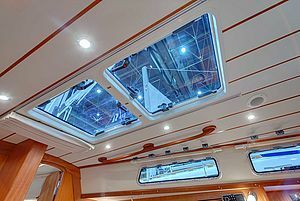 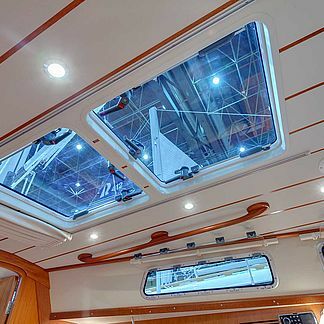 The aft cockpit 372 is in every aspect an all-new Frers design and is not based on the centre cockpit Hallberg-Rassy 37. 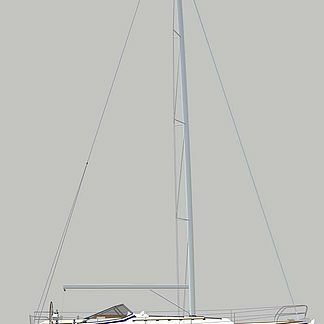 The mast is 1.05 m taller than on the 37. 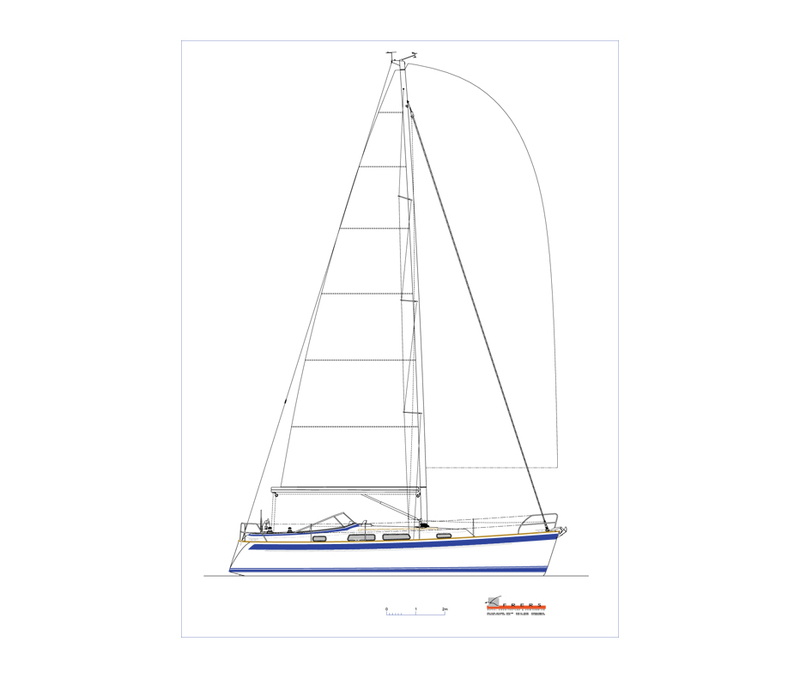 The modern sail plan is made for easy handling, with its greater mainsail and only slightly overlapping genoajib. 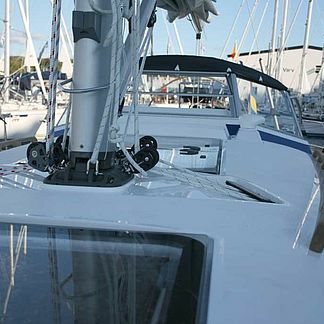 There is an option of self tacking jib. 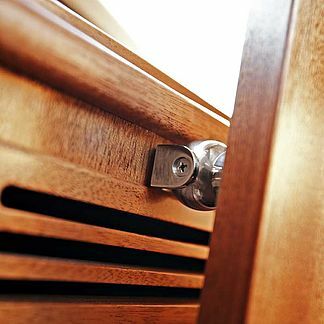 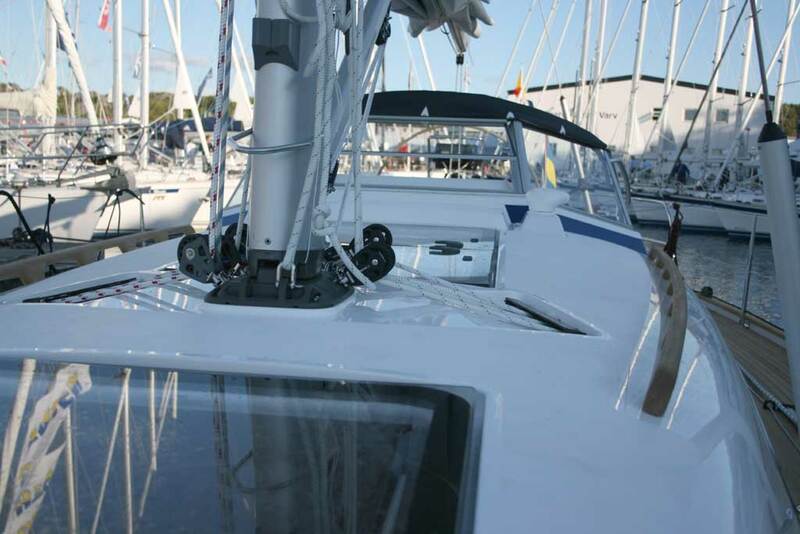 A powerful backstay tensioner is fitted as standard. 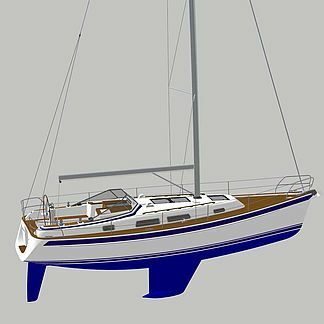 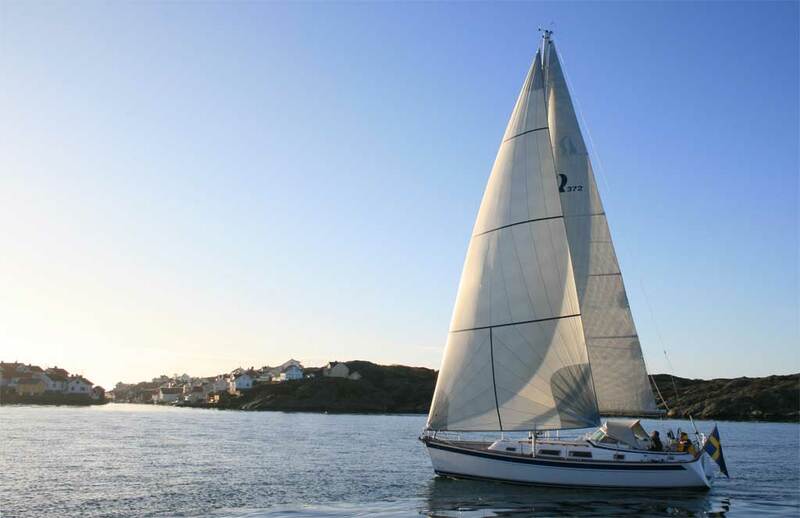 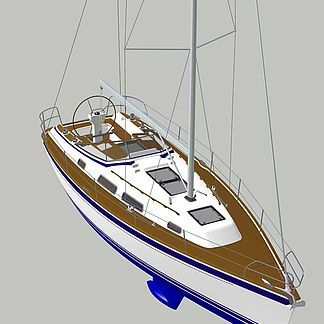 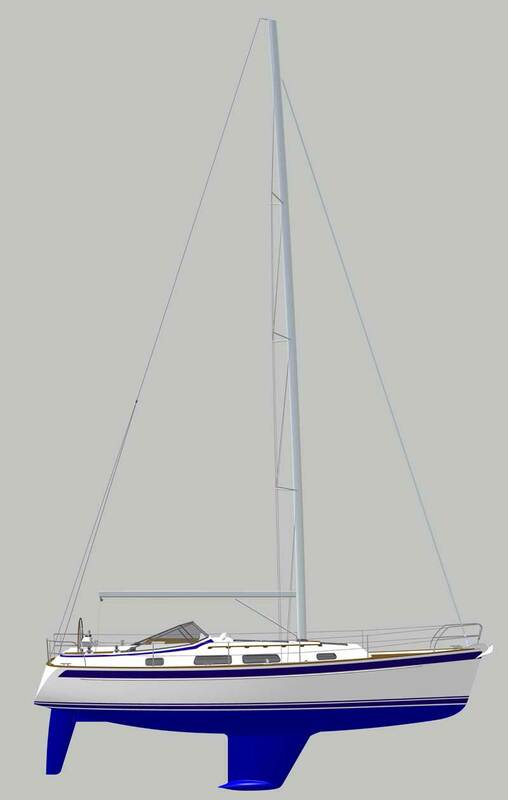 The rig has triple swept-back spreaders, the top shrouds go out to near the toe rail and the lowers are positioned to the superstructure for easy passage on deck, and for easy sheeting of the foresail. 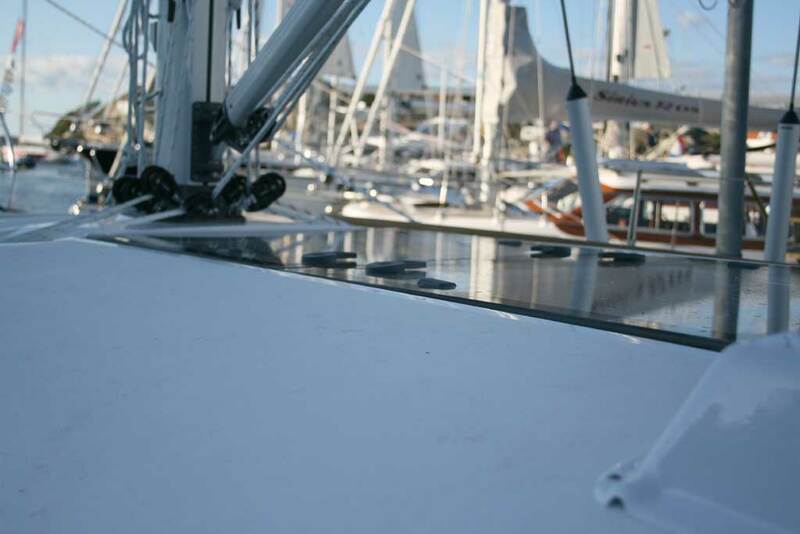 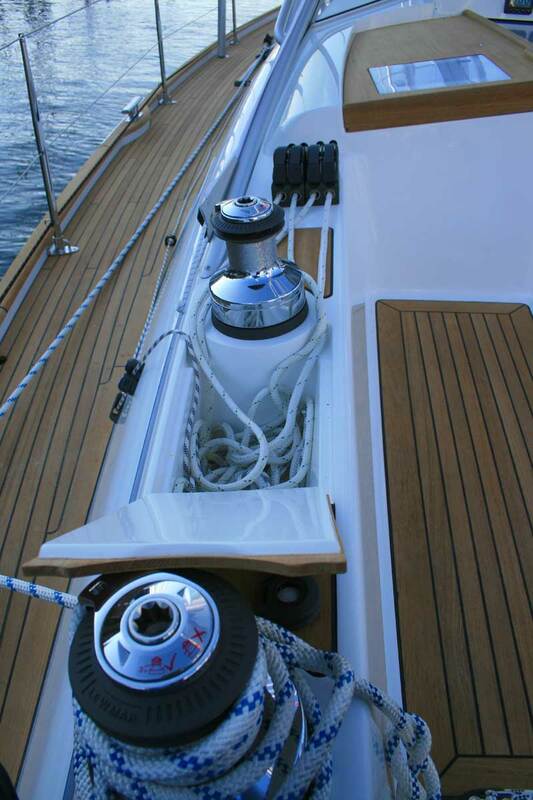 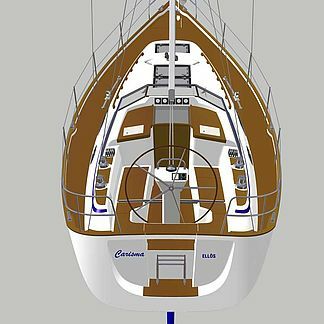 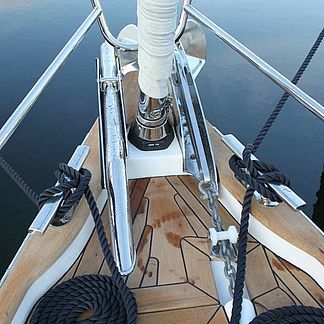 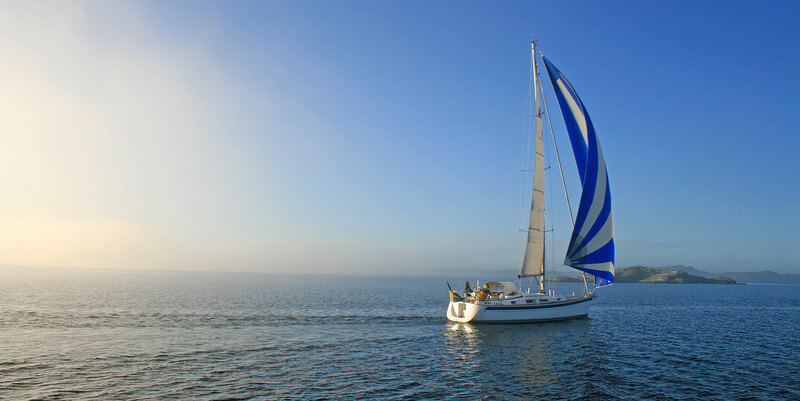 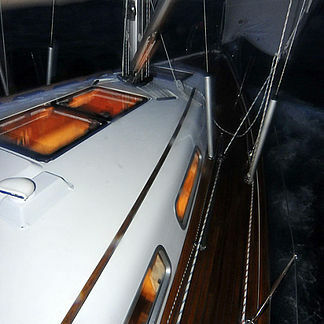 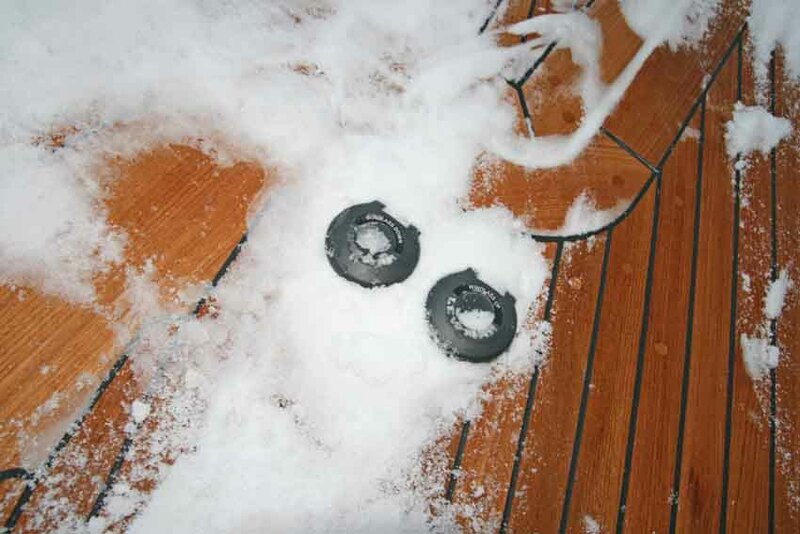 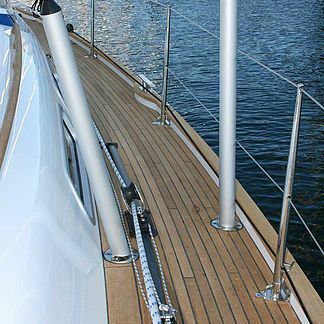 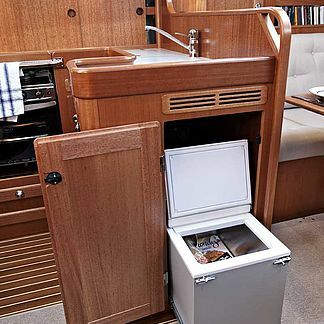 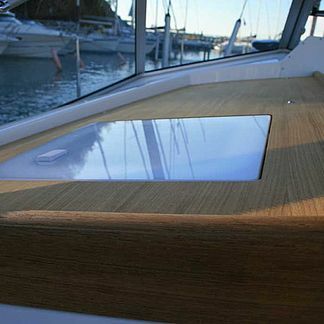 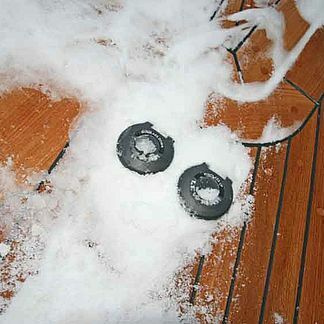 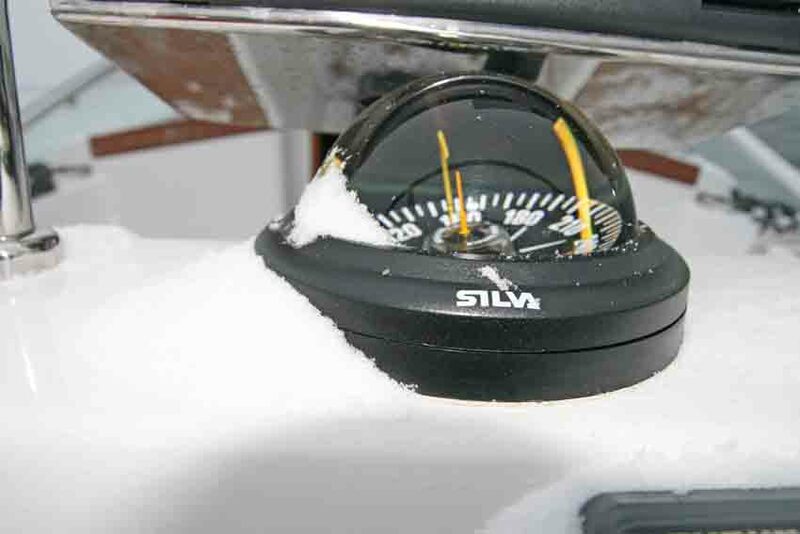 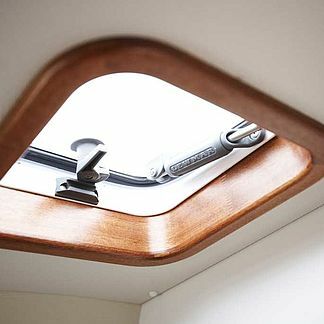 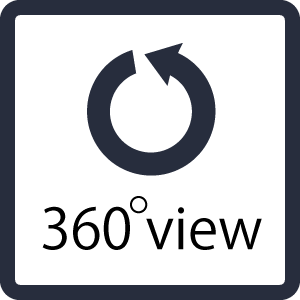 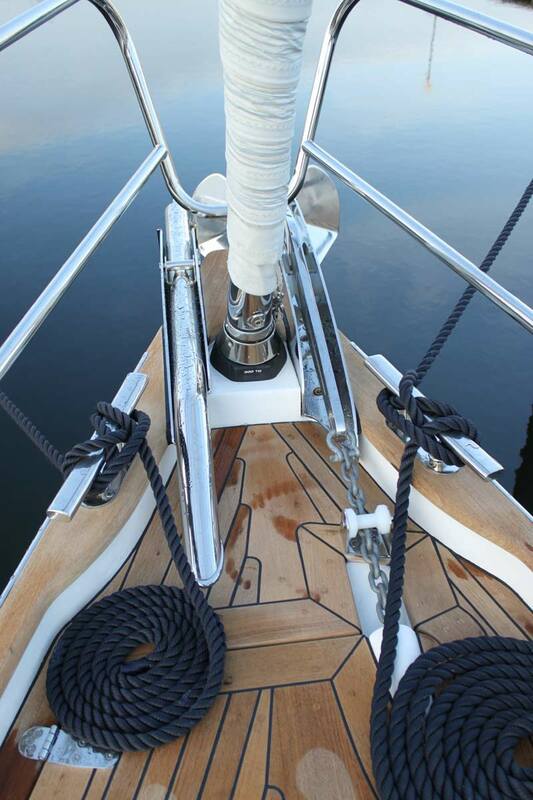 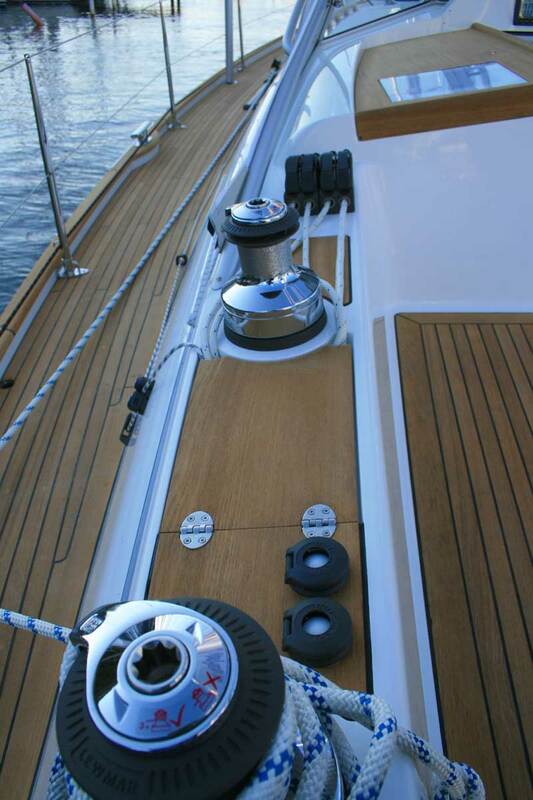 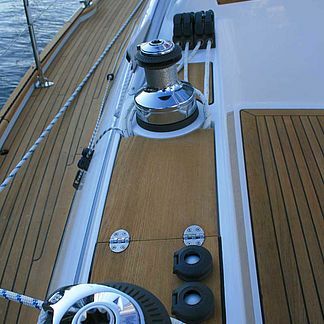 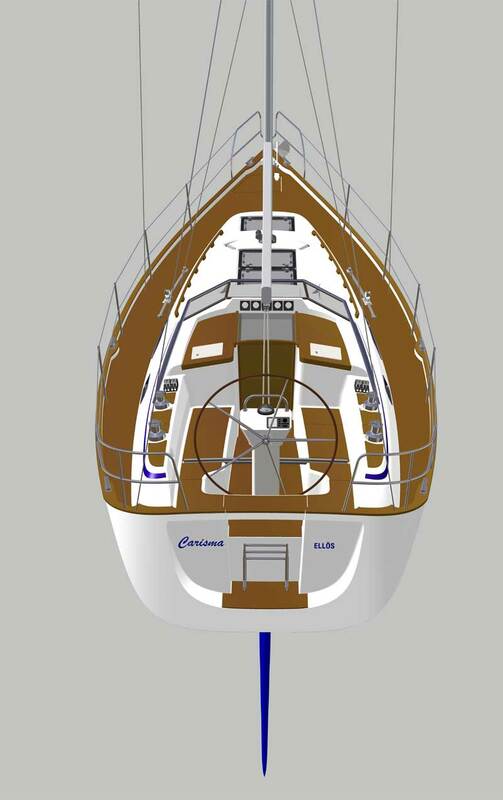 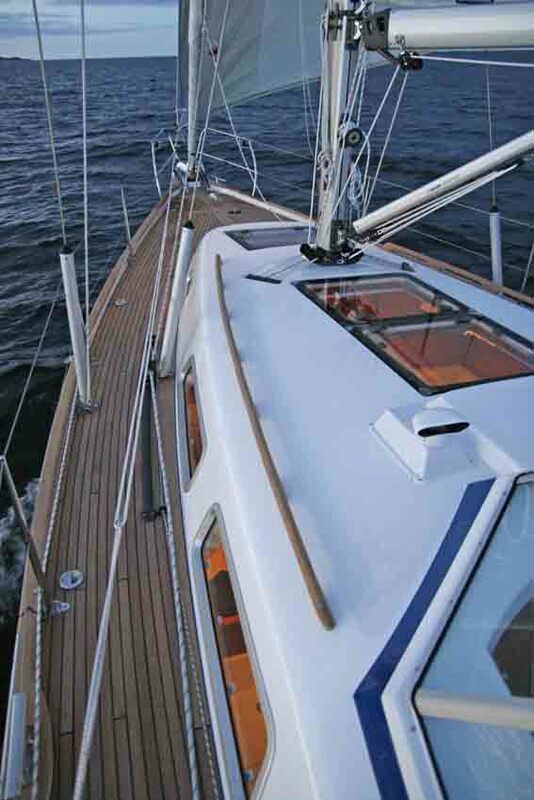 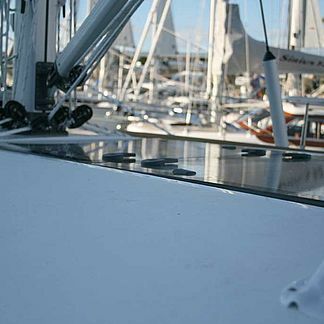 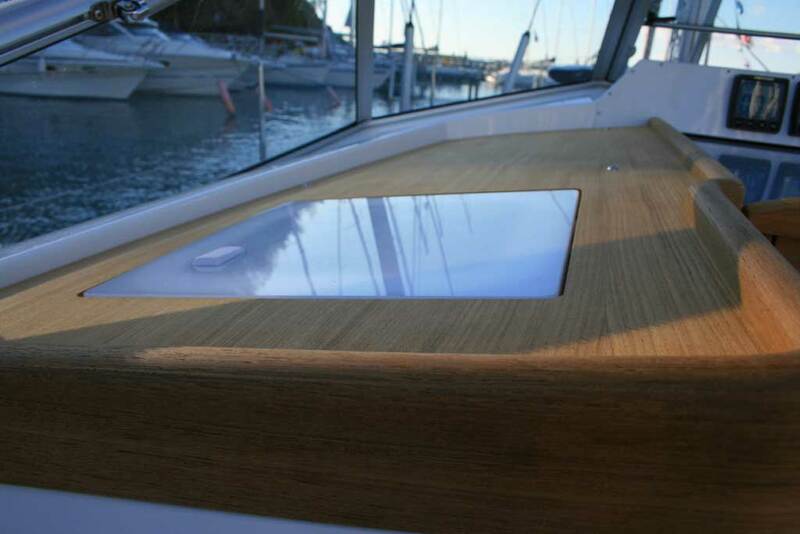 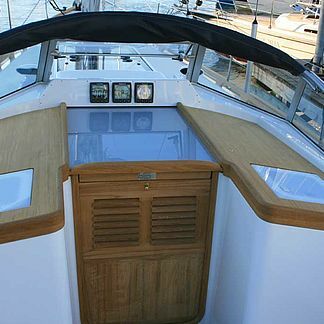 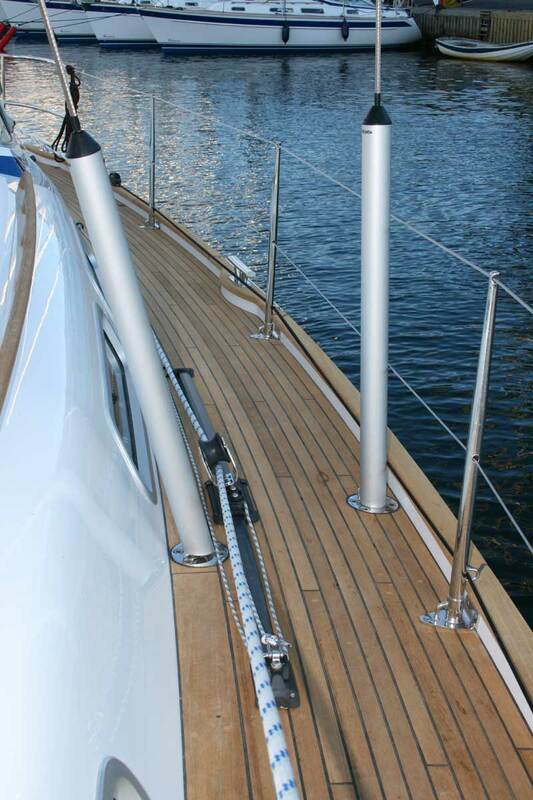 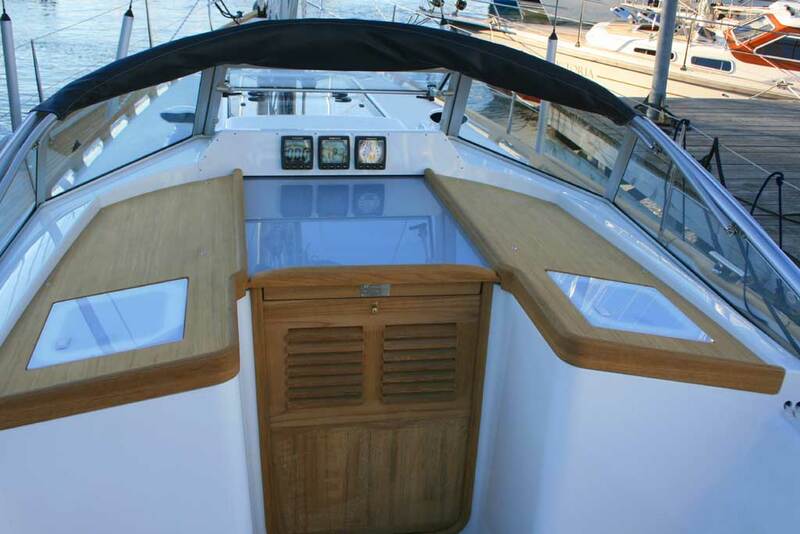 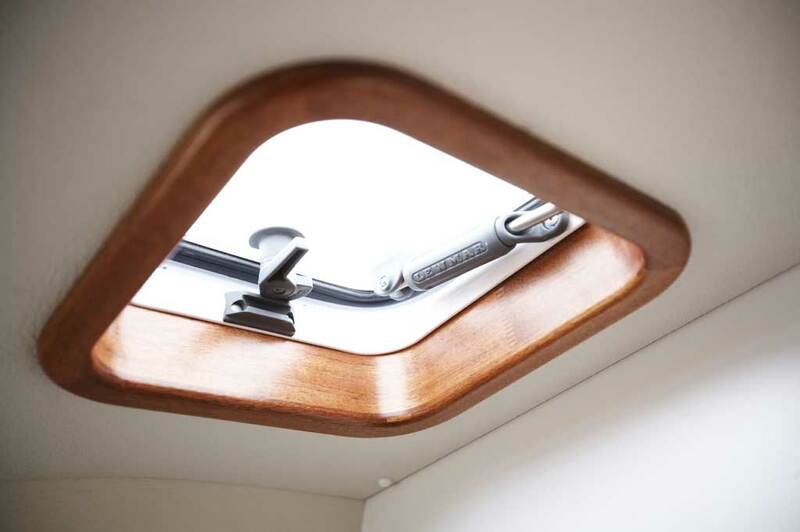 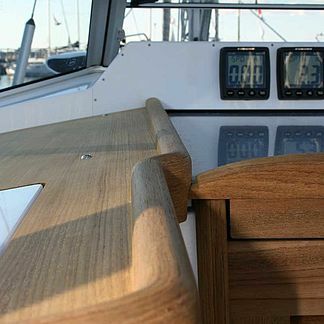 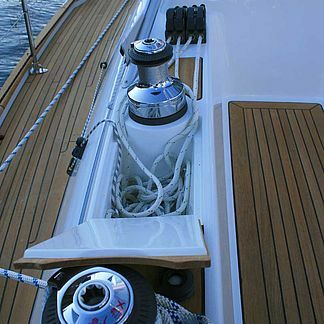 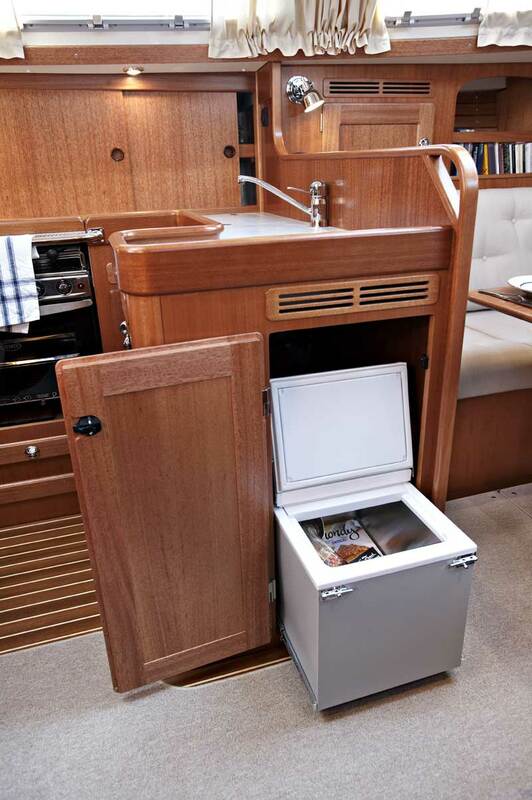 An optional Code Zero or gennaker is flown between the masthead and a removable bowsprit. 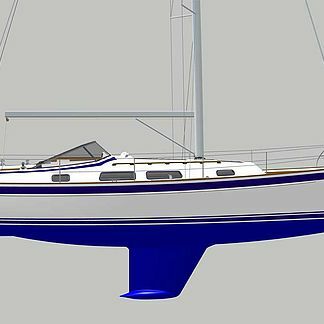 Frers’ speed prediction diagram indicates that the new Hallberg-Rassy 372 will even be faster than the 40, which is recognized as a fast yacht. 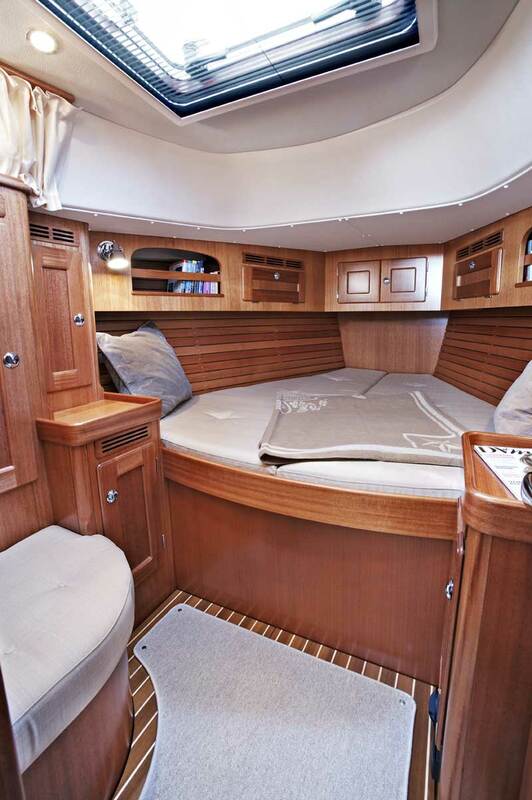 Below deck the interior is roomy and bright. 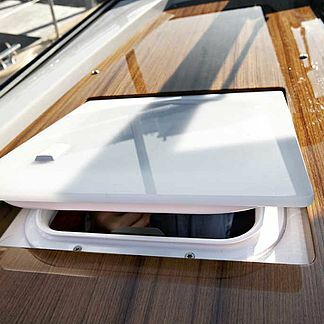 There are two deck hatches in the saloon. 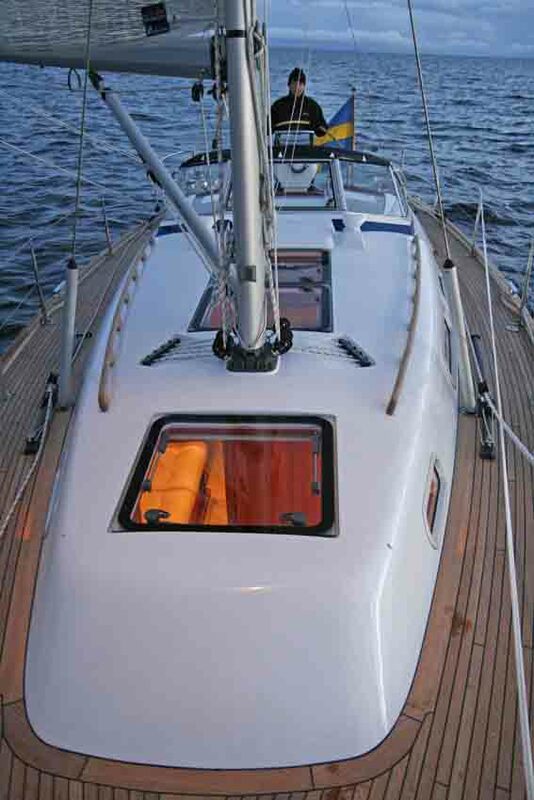 All side port lights are opening and the same large size as on the Hallberg-Rassy 54. 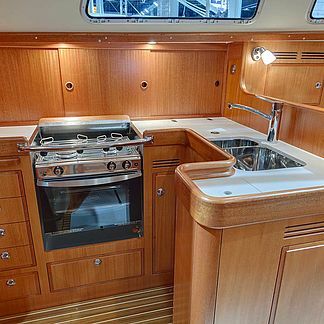 The galley is big, U shaped and seagoing. 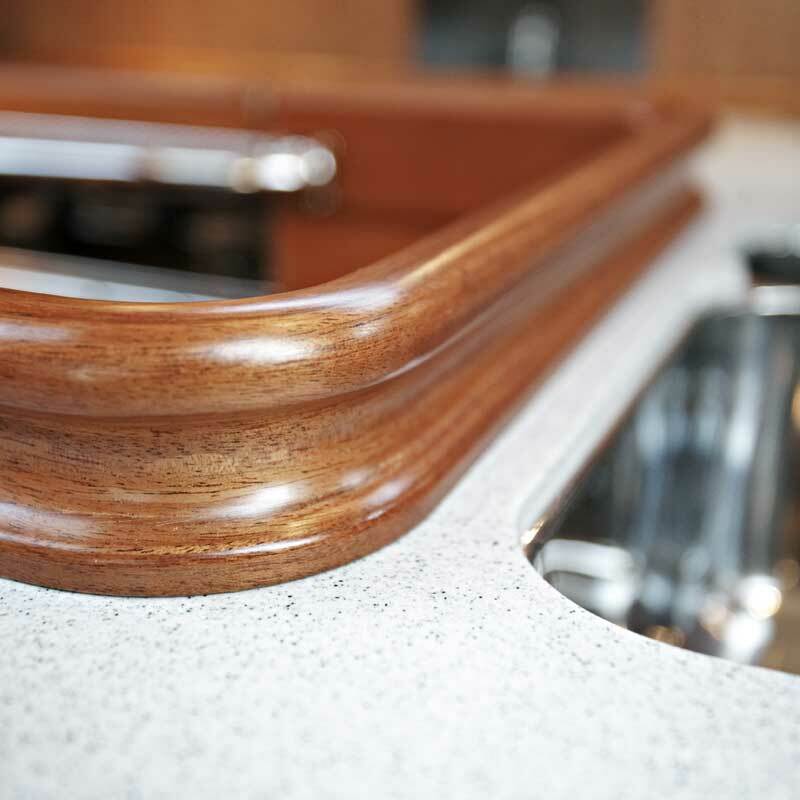 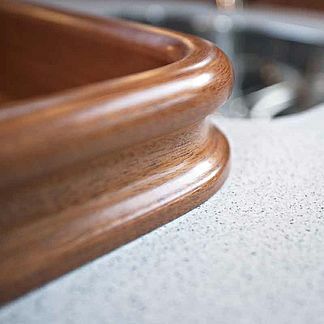 The galley worktop is in a solid composite stone material. 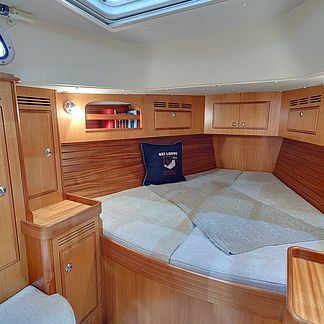 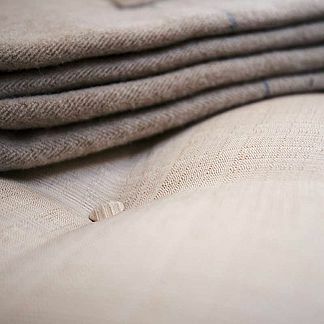 Both sofas in the saloon are a full two metres long. 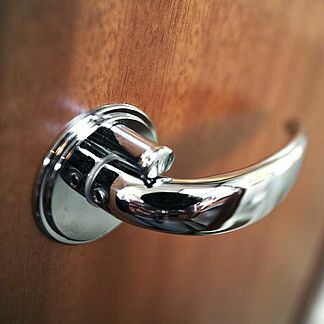 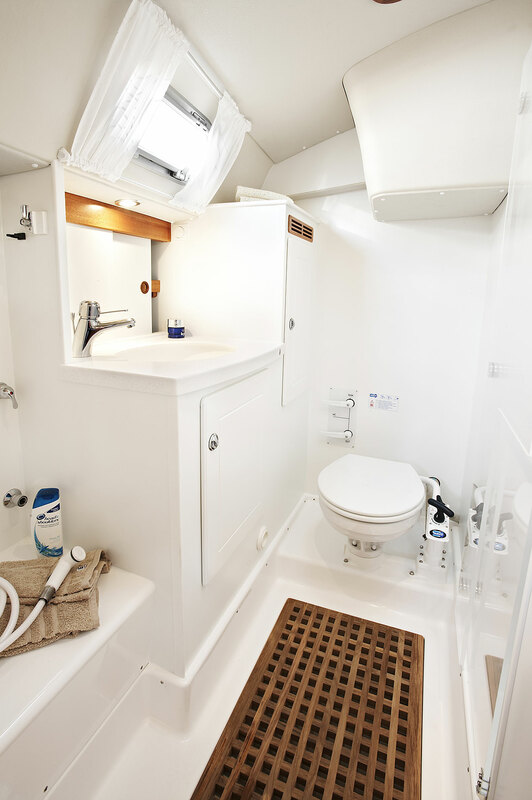 The roomy head is equipped with a wet locker and has a separate shower with PlexiGlass doors. 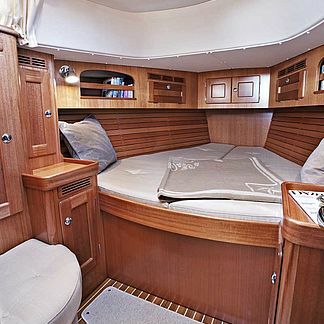 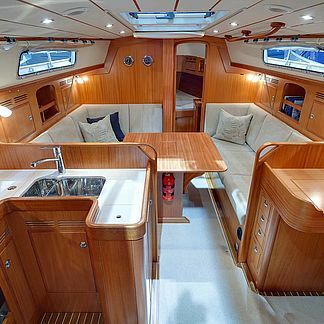 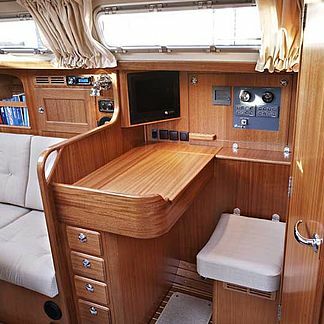 The forward cabin is extremely large and generous. 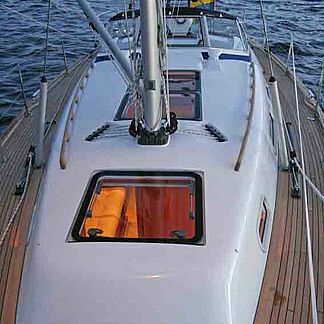 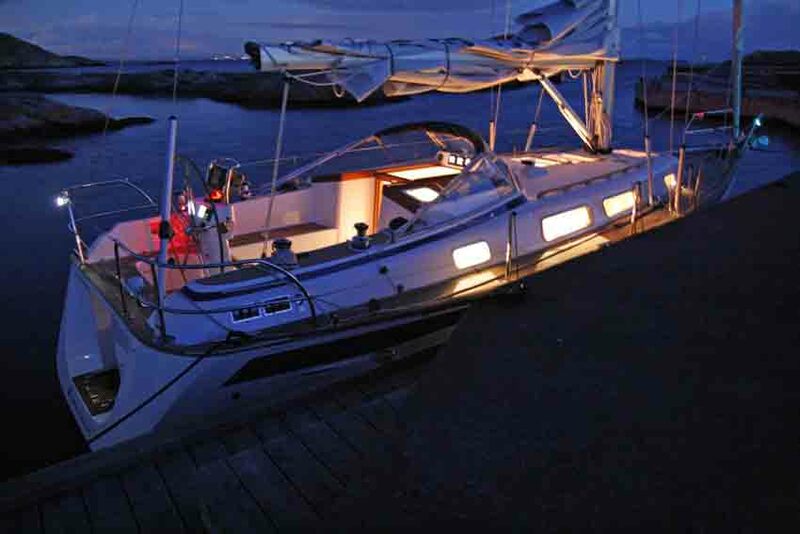 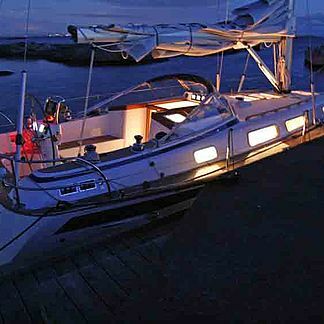 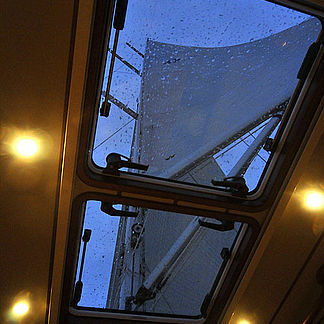 The v berth is 210 cm long, 68 cm wide at the foot end and 202 cm in the aft end. 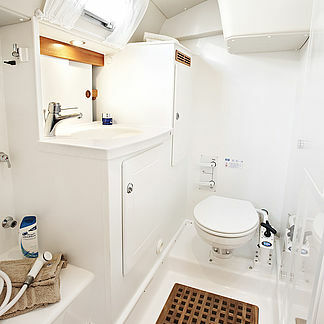 There is a seat, two hanging lockers and two vanities in the forward cabin. 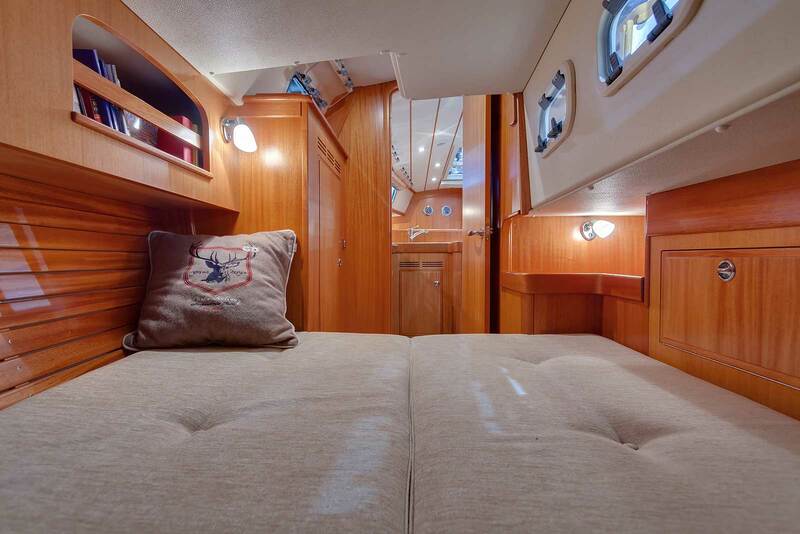 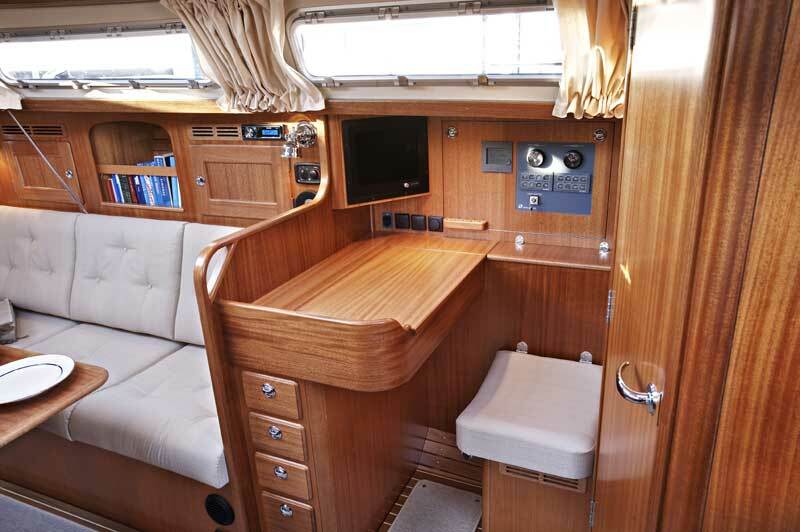 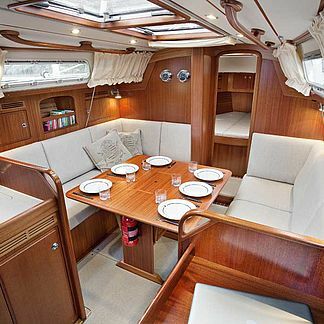 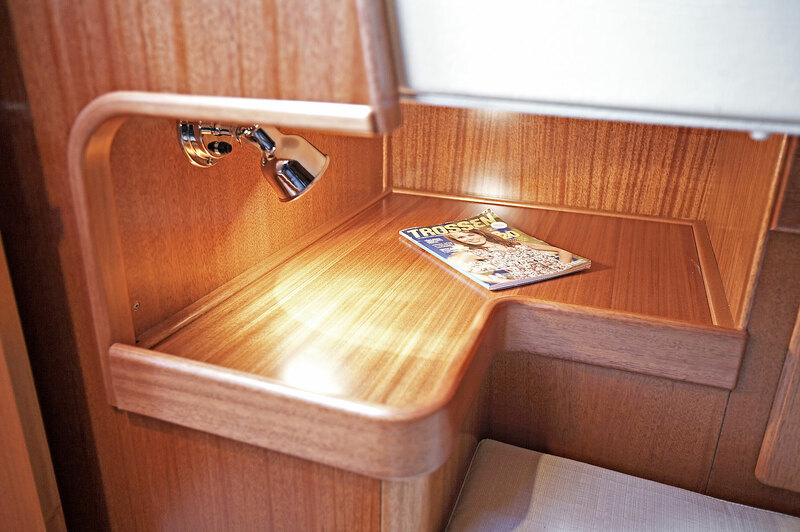 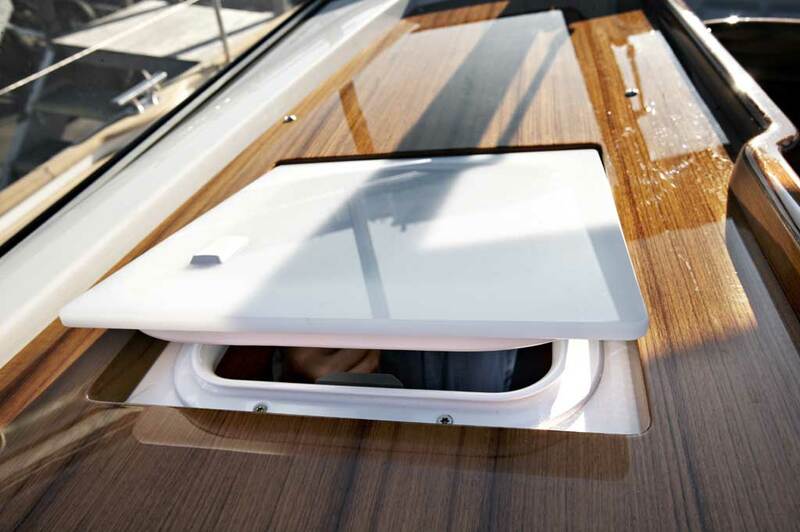 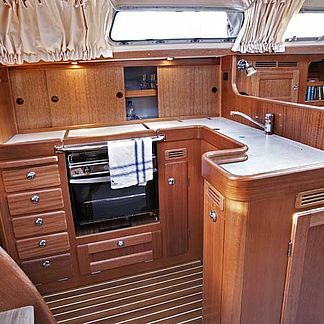 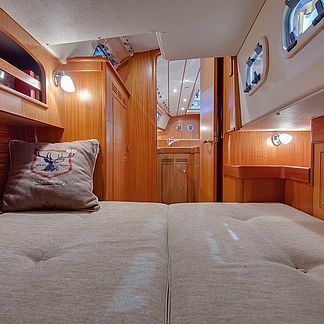 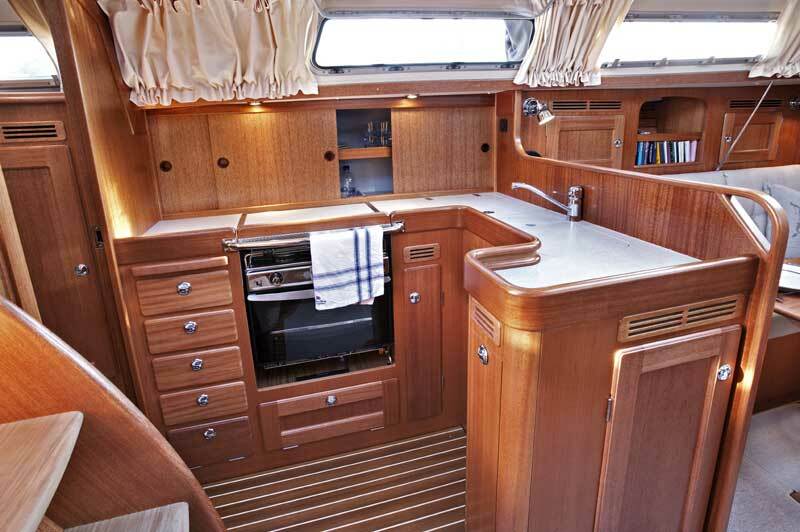 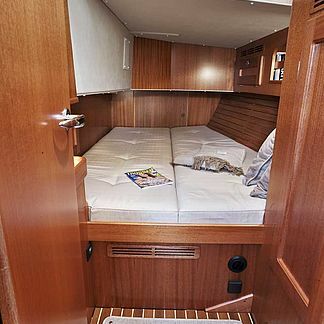 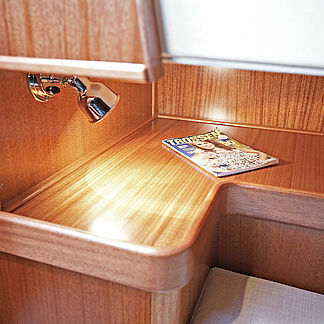 The aft cabin also has a comfortable and unusually wide double berth. 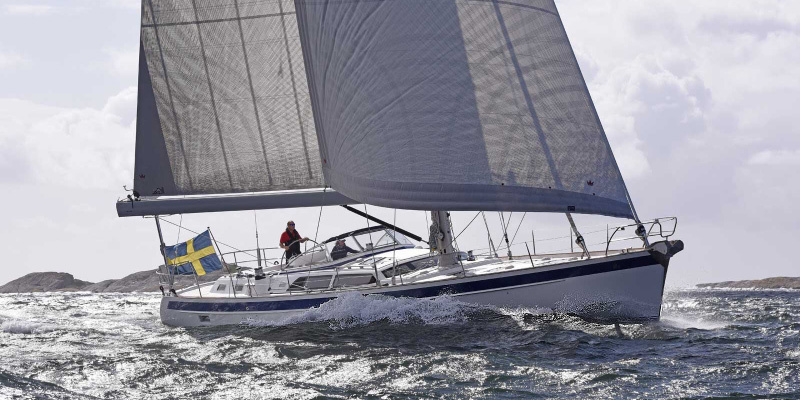 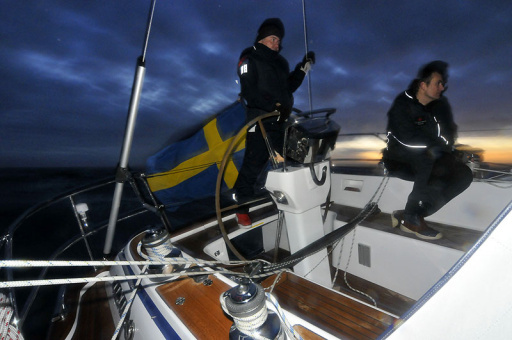 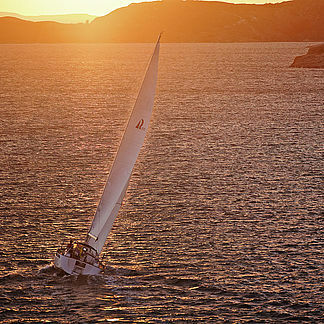 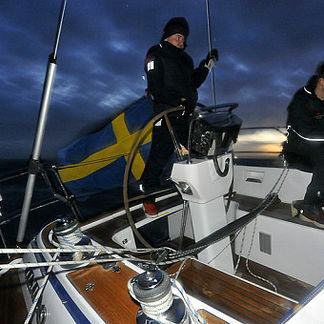 Already after the first tack it was clear: Hallberg-Rassy 372 sails like a dream! 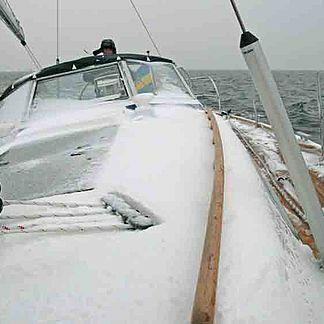 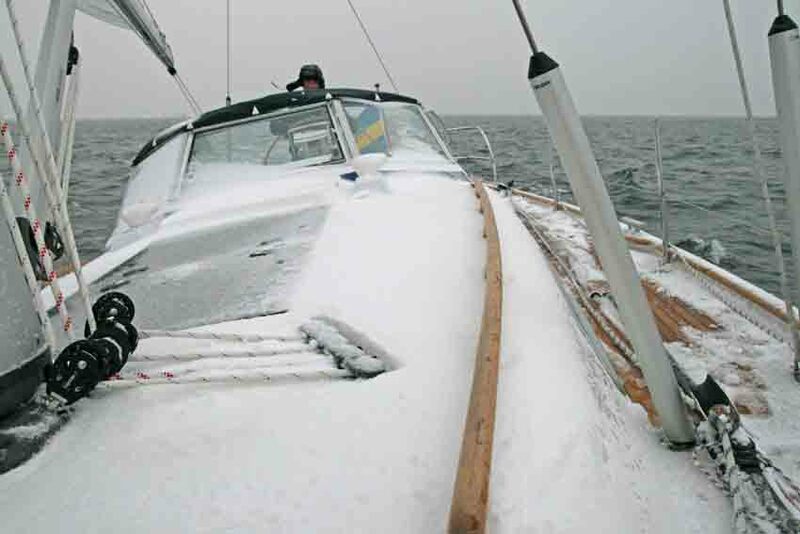 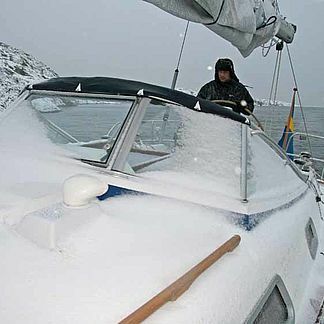 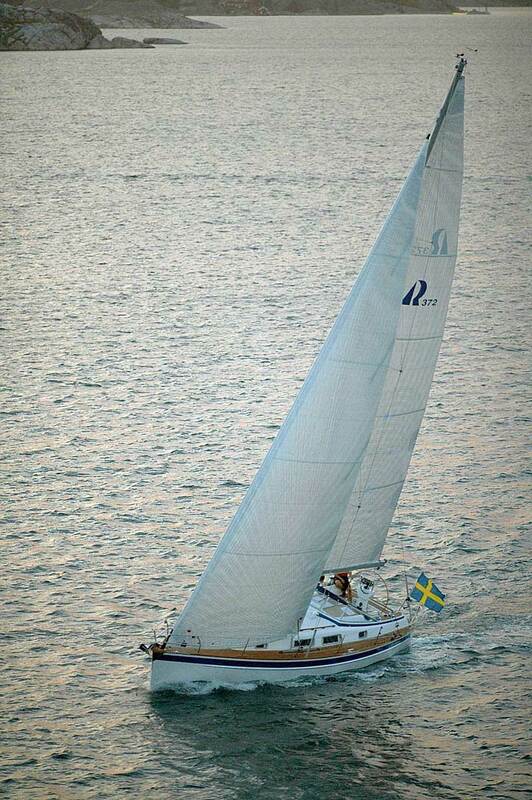 She is quick, stiff, easy to steer in all conditions. 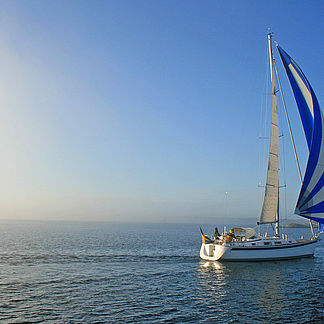 She moves gently in the water, always under control. 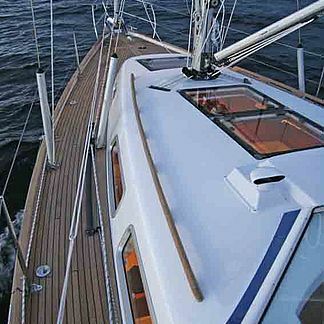 It is great fun sailing her! 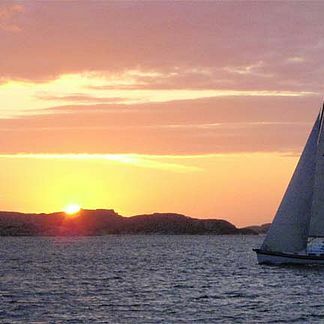 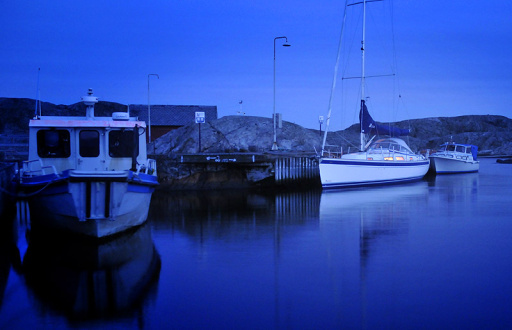 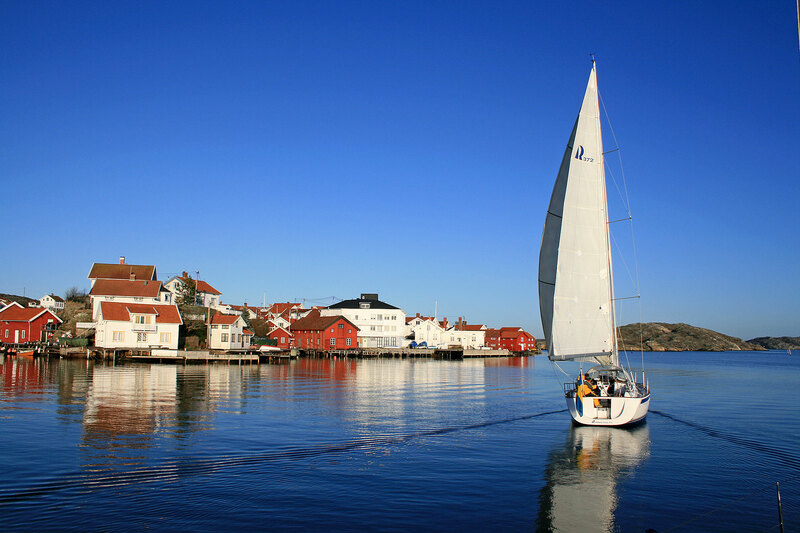 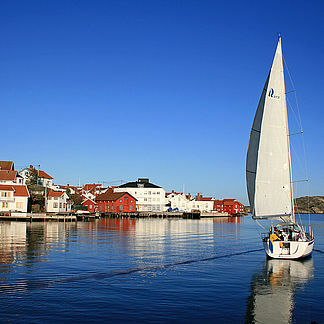 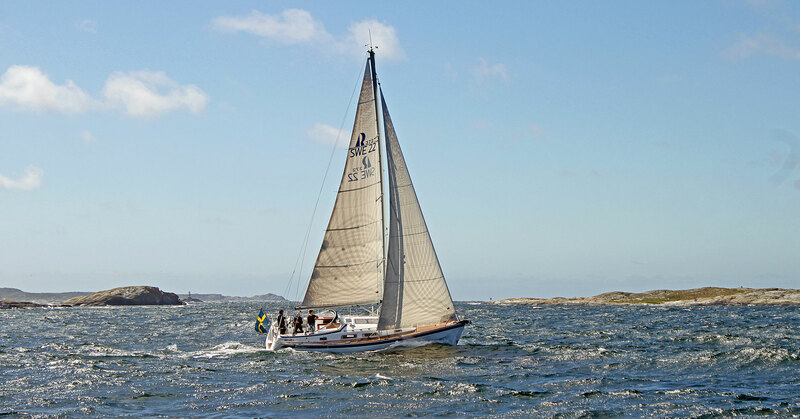 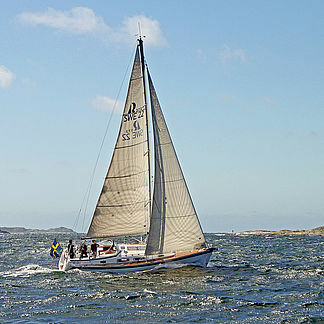 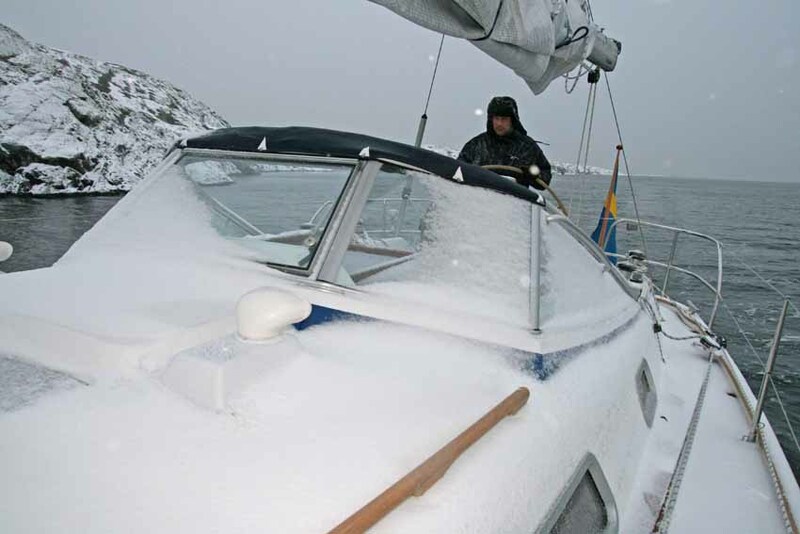 Tjorn Runt is one of the world´s largest inshore races. 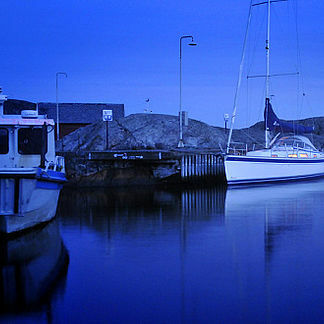 471 boats applied 2010. 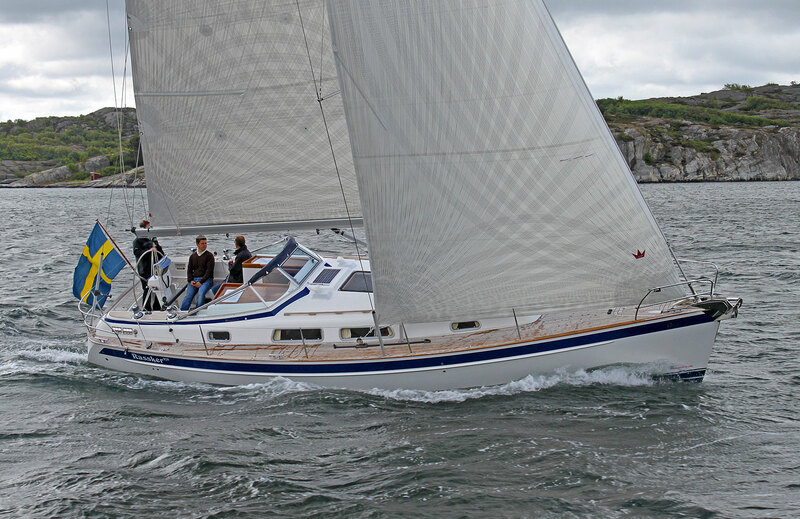 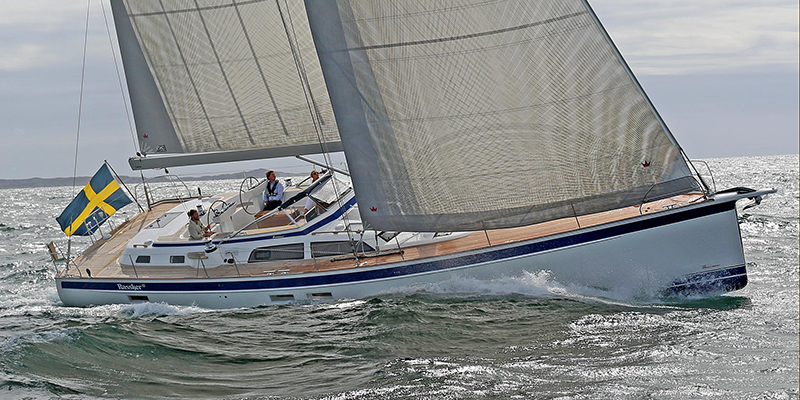 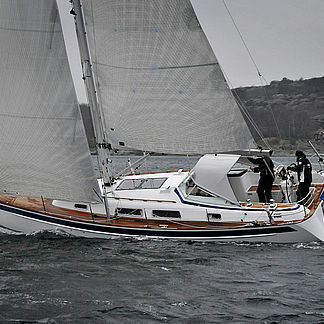 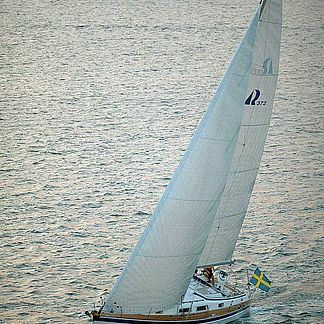 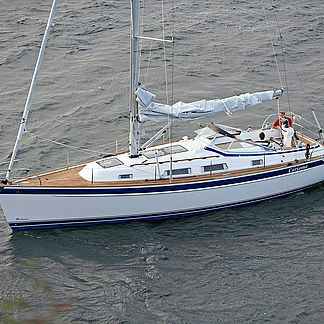 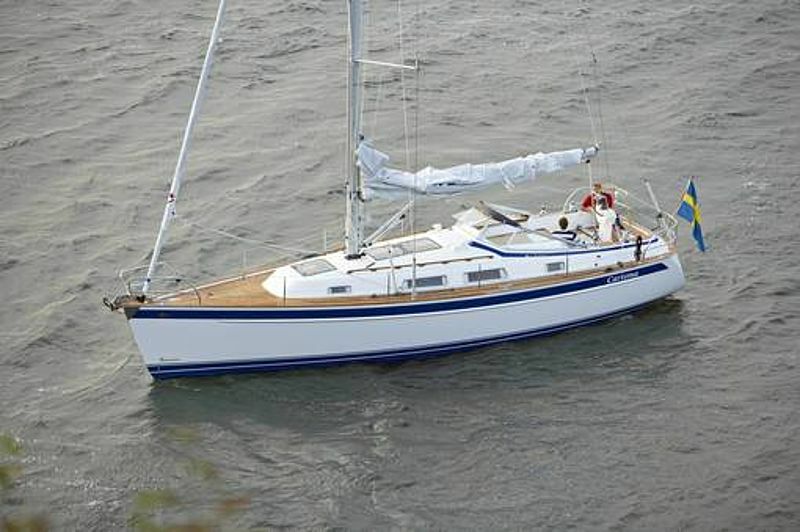 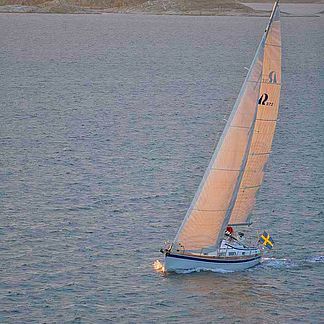 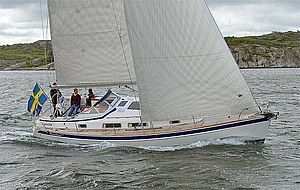 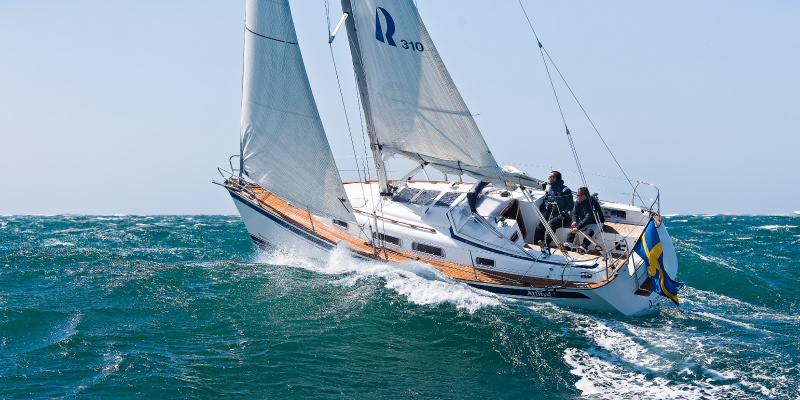 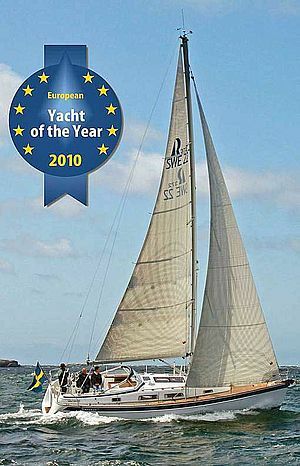 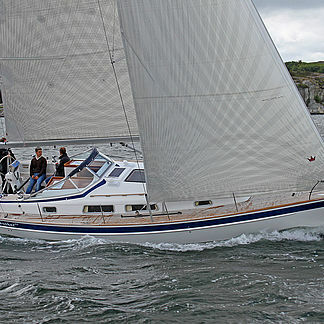 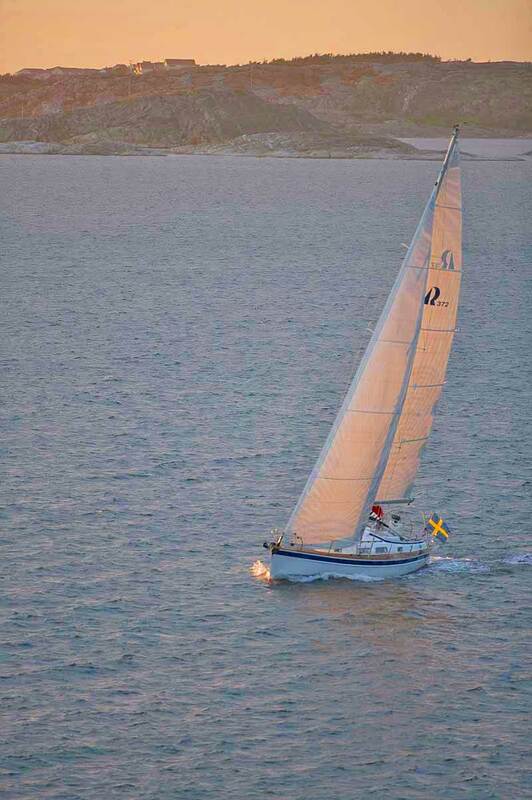 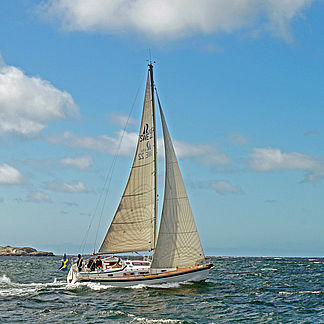 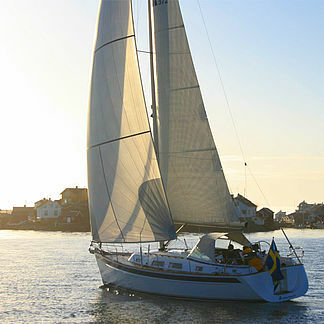 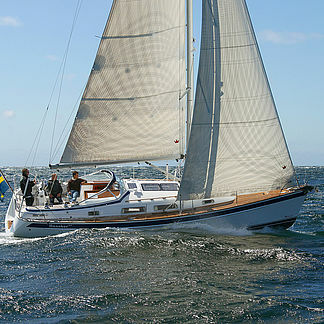 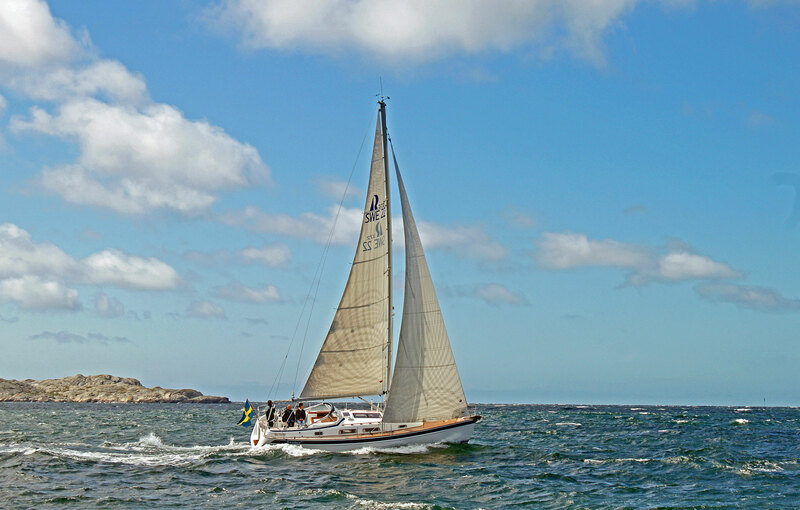 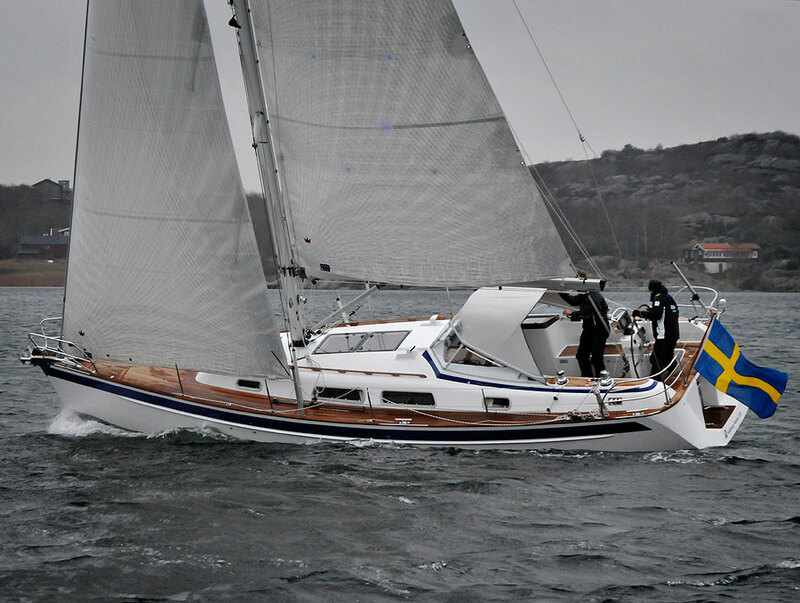 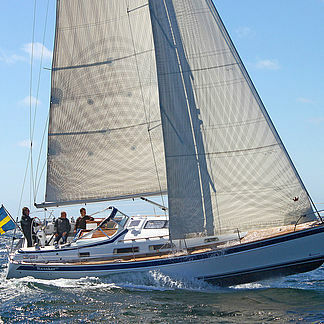 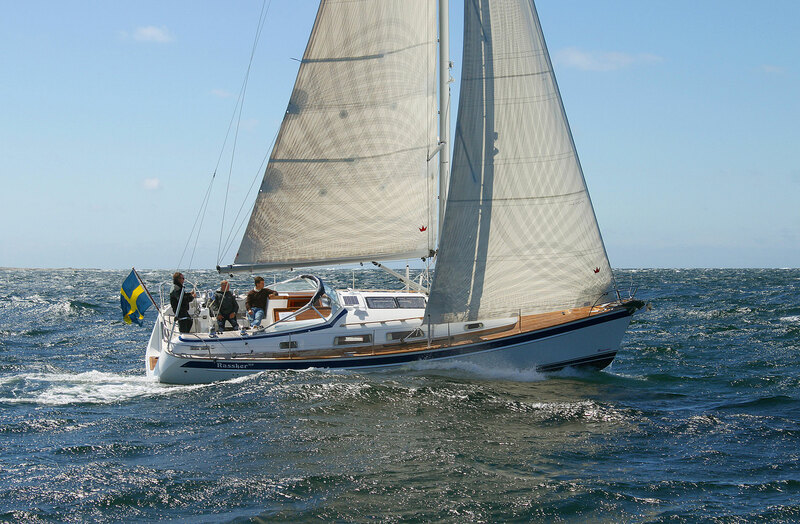 A Hallberg-Rassy 372 won her class. 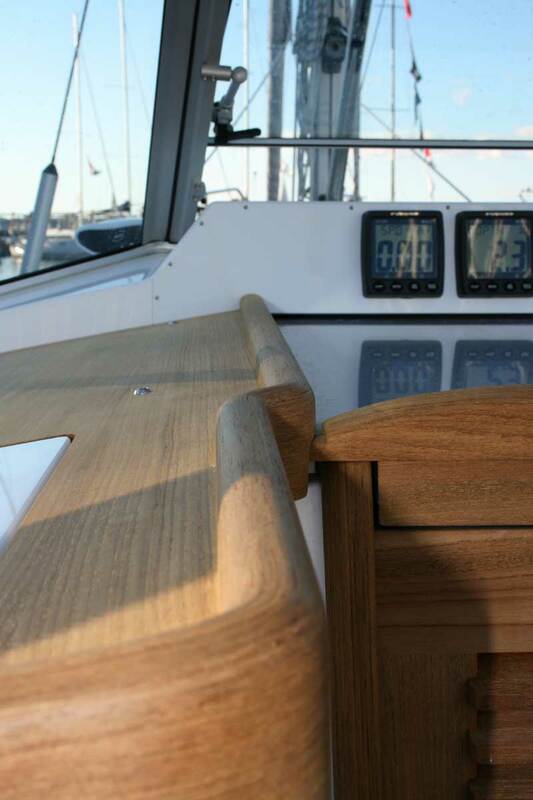 This proves that a comfortable cruiser doesn't need to lack in performance. 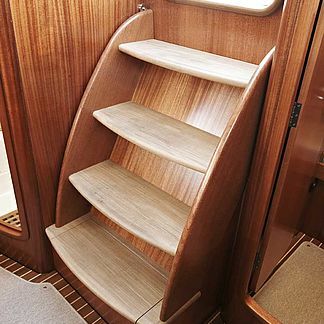 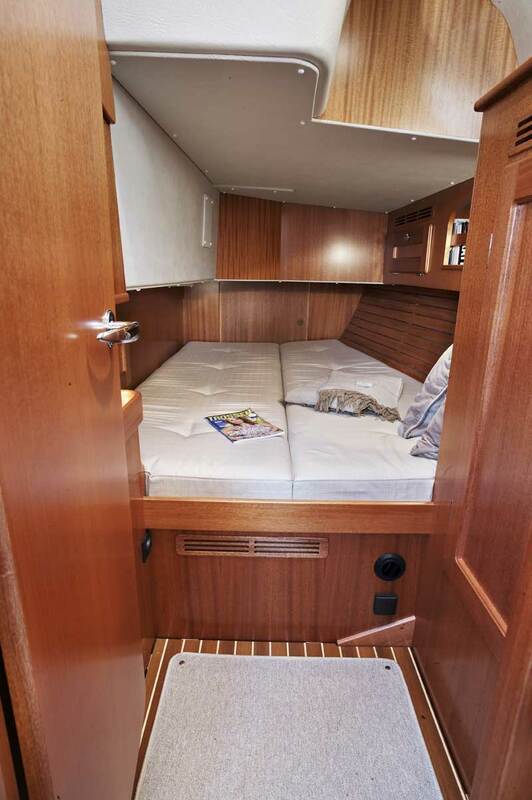 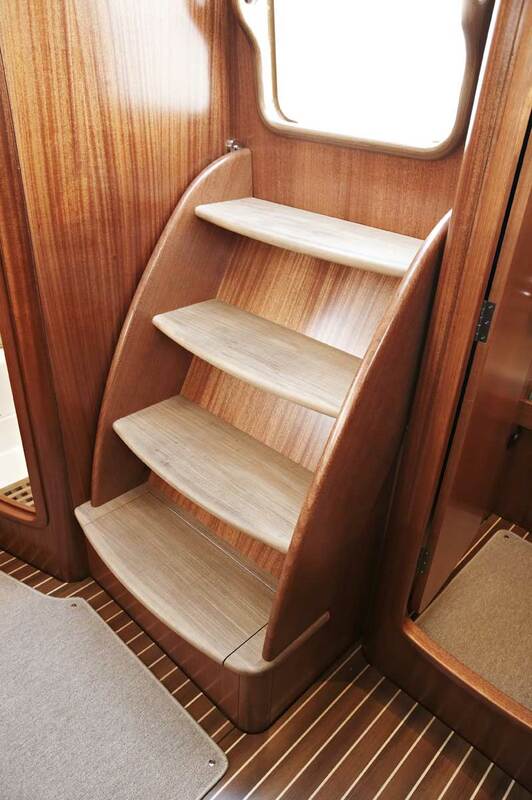 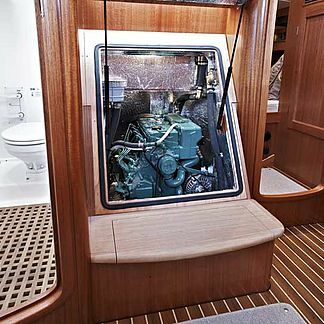 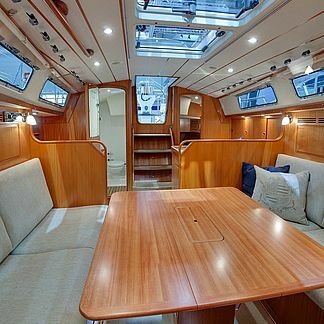 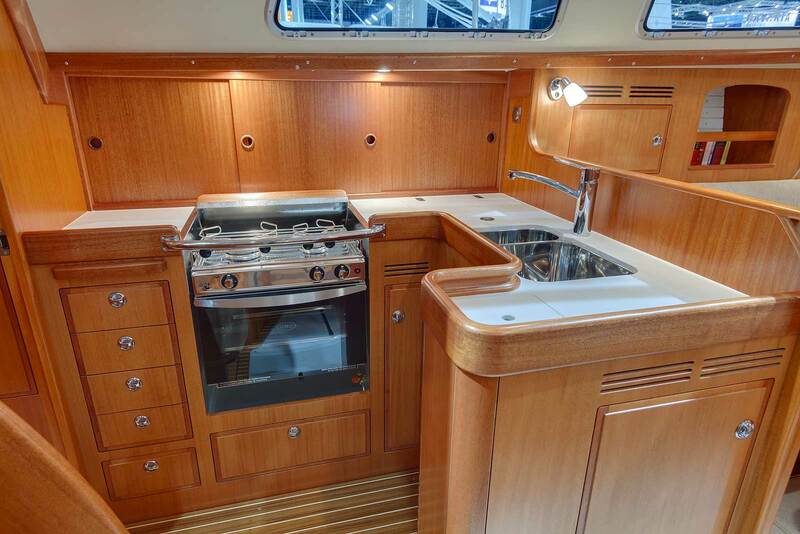 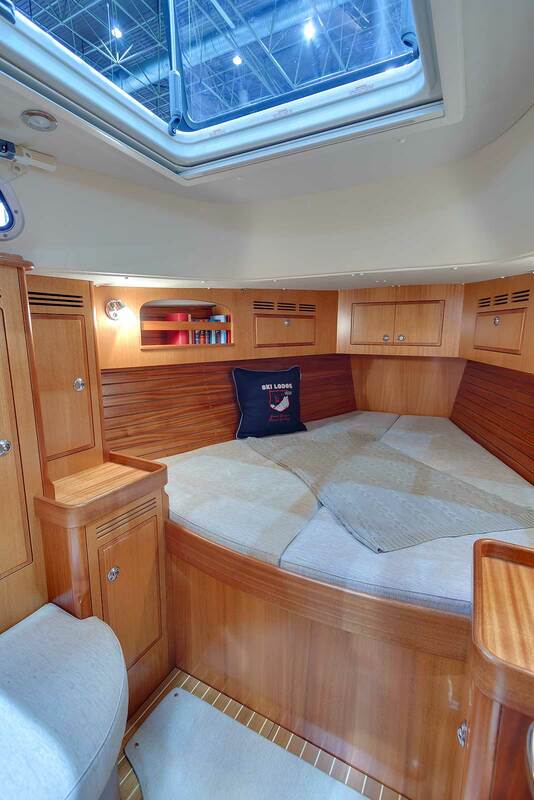 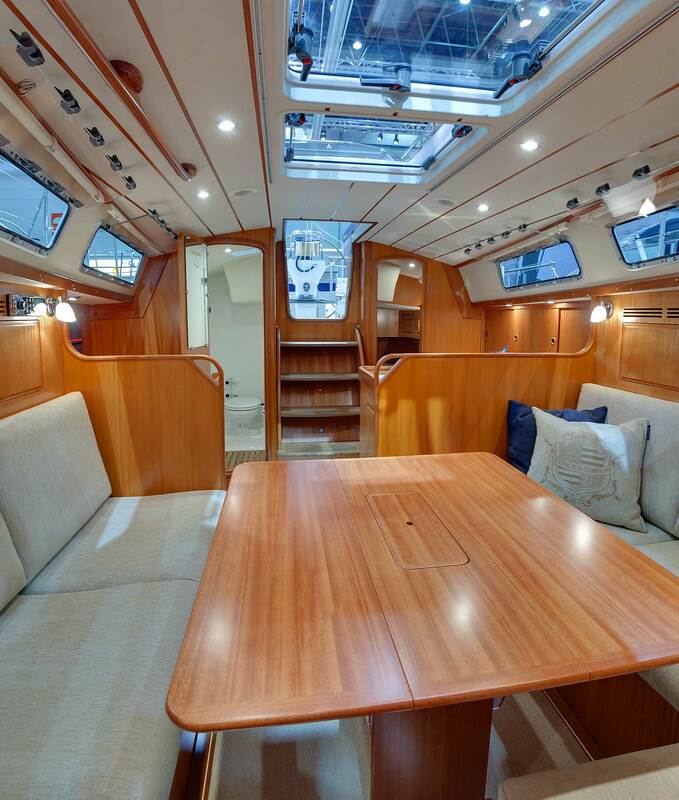 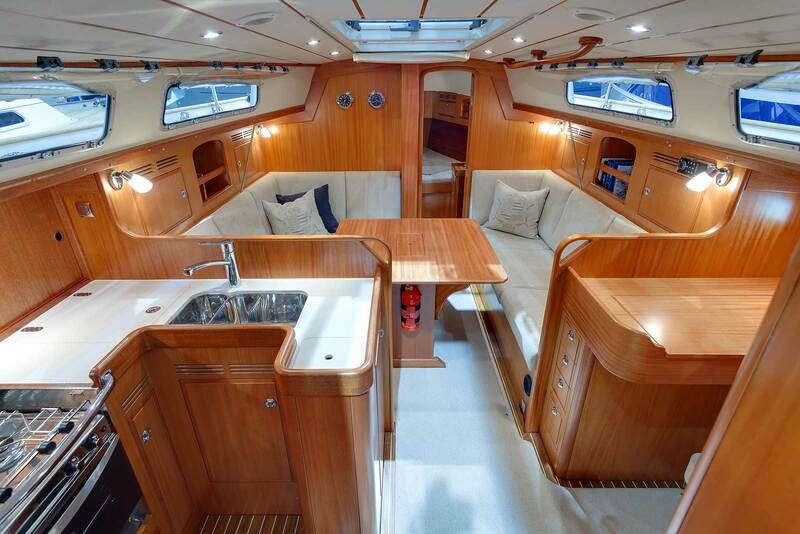 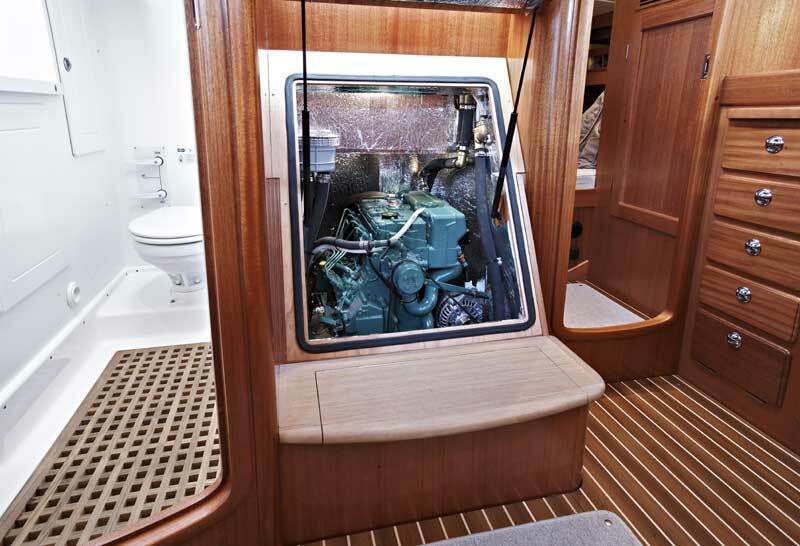 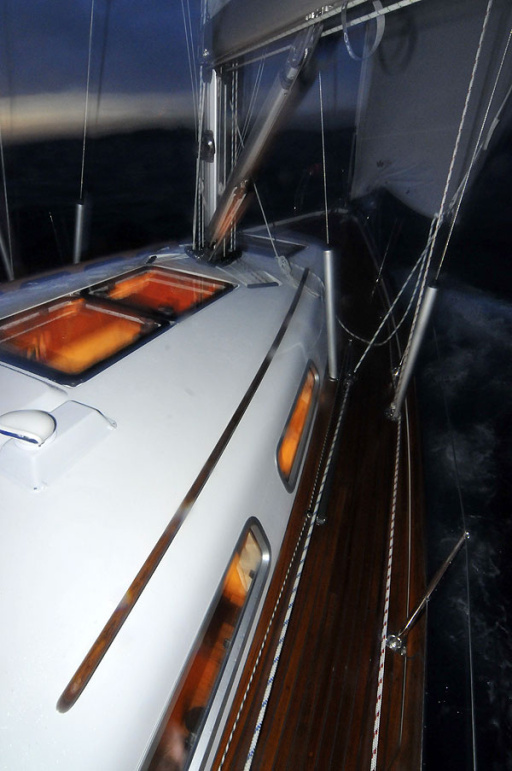 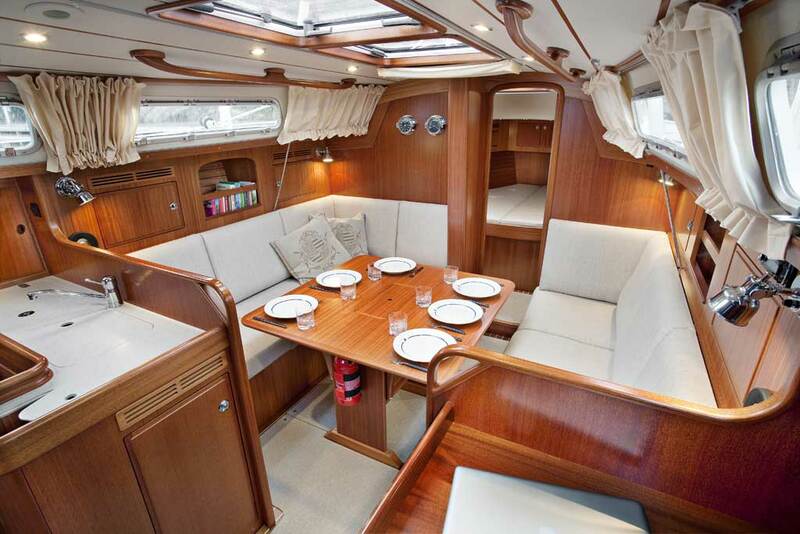 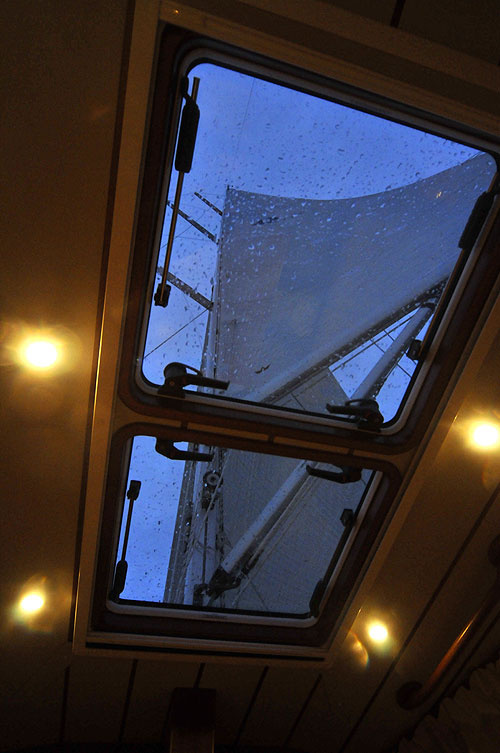 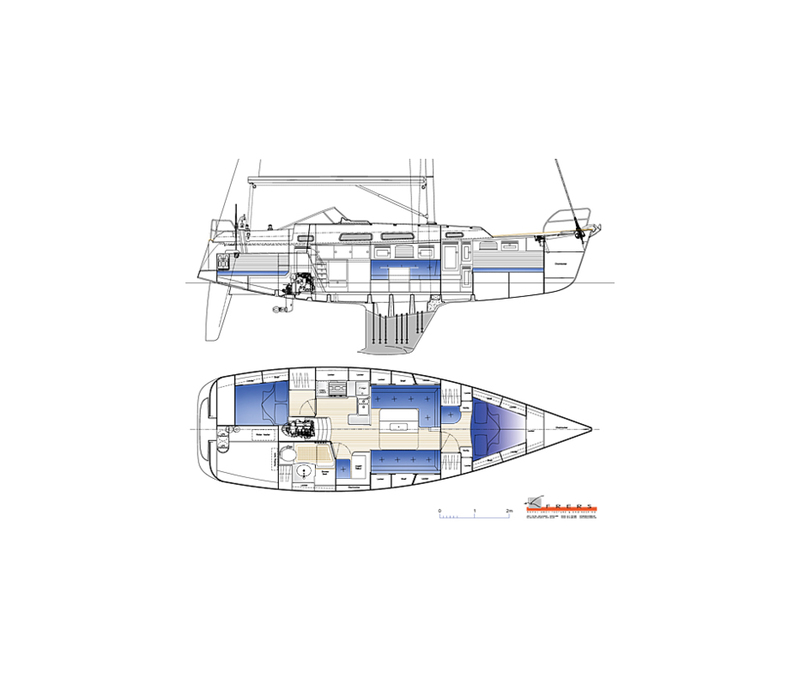 For a 360 degrees view of a Hallberg-Rassy 372 interior from 2014, please follow this link. 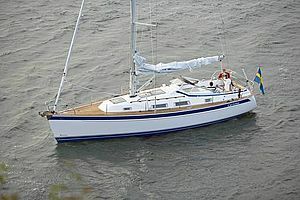 11.35 m / 37' 3"
10.25 m / 33' 8"
3.60 m / 11' 10"
1.93 m / 6' 4"
17.80 m / 58' 5"